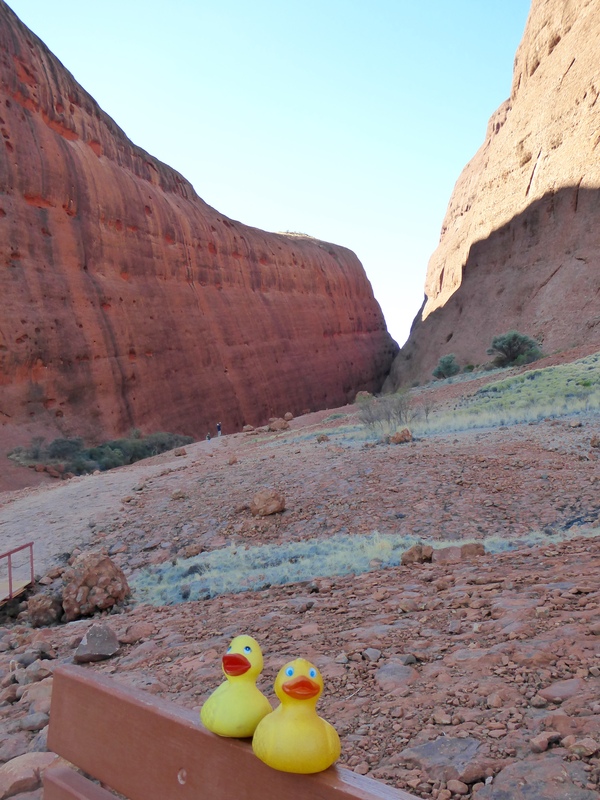 Zeb and Eider and the humans visited Uluru-Kata Tjuta National Park. 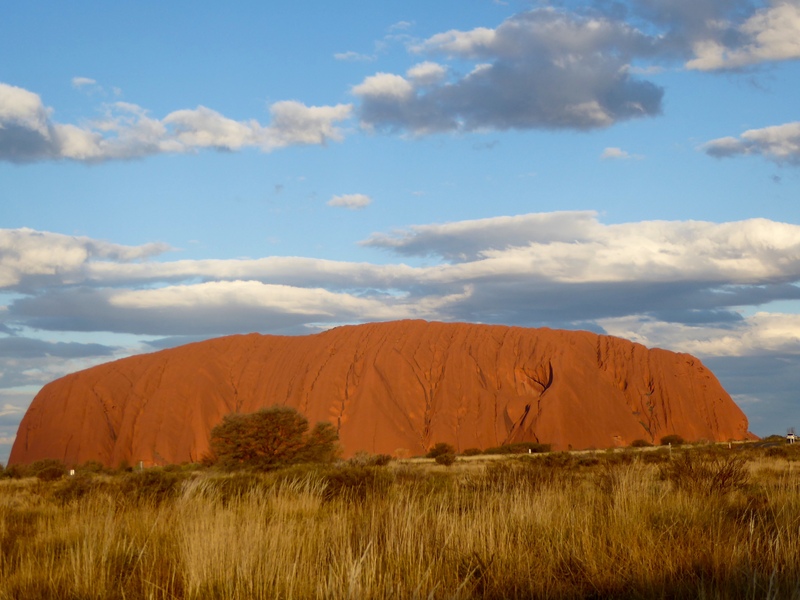 We arrived in the afternoon and immediately arranged to view Uluru, previously called Ayers Rock, at sunset. The rock seems to change color as the sun begins to set. This is one of our favorite sunset photos. The next morning we returned to view the sunrise. 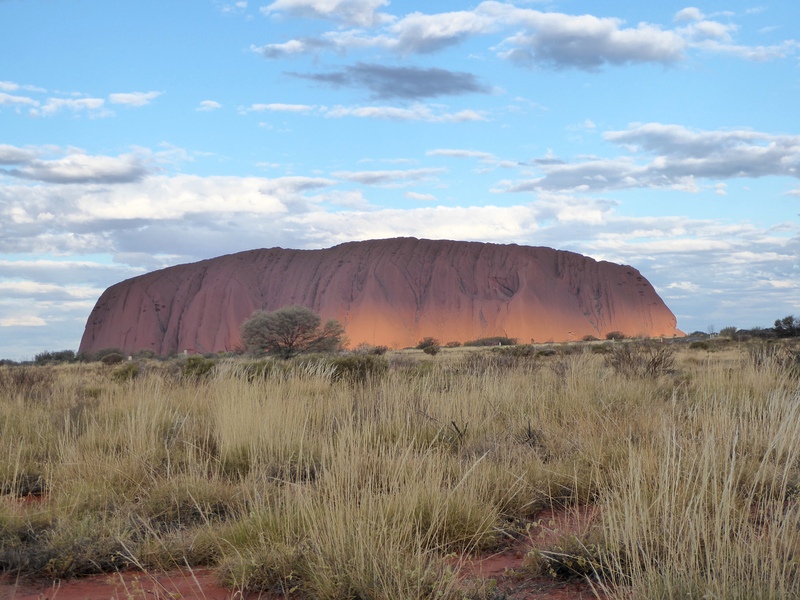 The sun is hitting Uluru now, creating light and great shadows. The rock is so large that photographs are difficult. 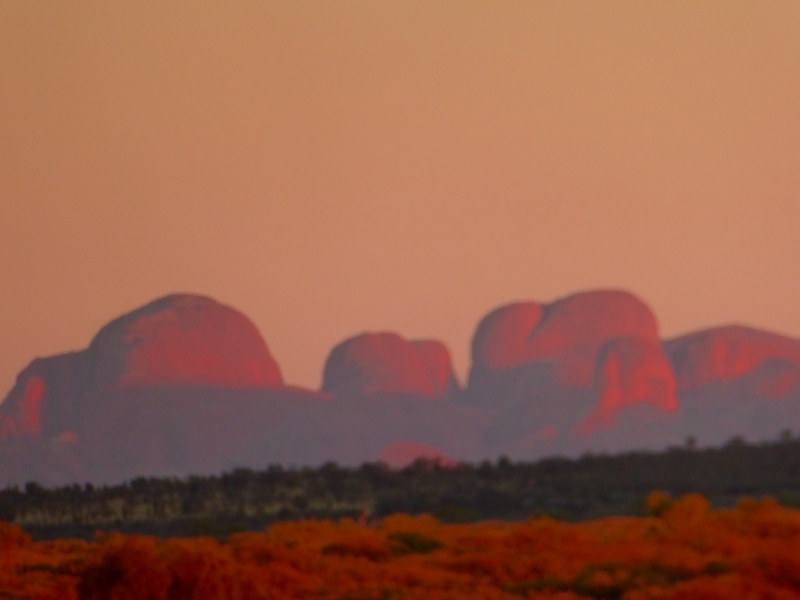 From Uluru, we could see the rising sun reflect on the Kata Tjuta formation. The entire scene of sunrise and huge rocks is very impressive. 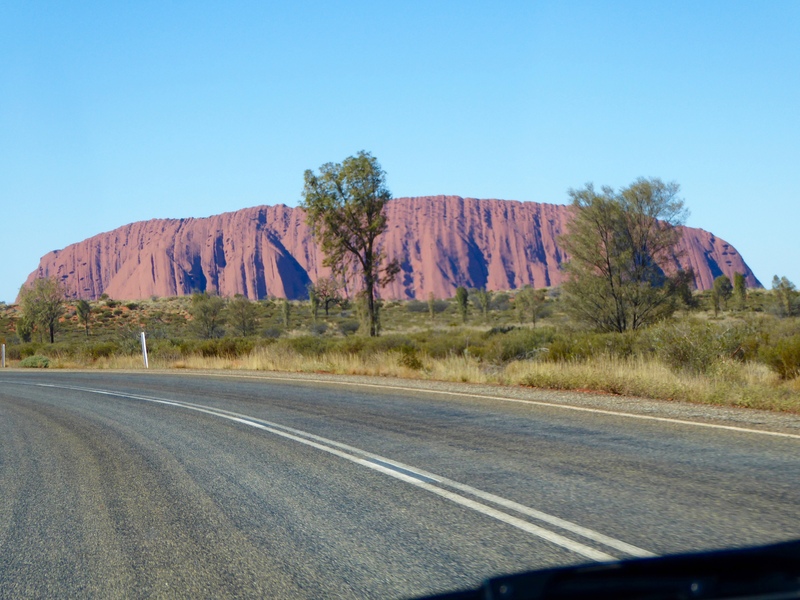 Later we drove around Uluru. You can see the rock is not smooth. 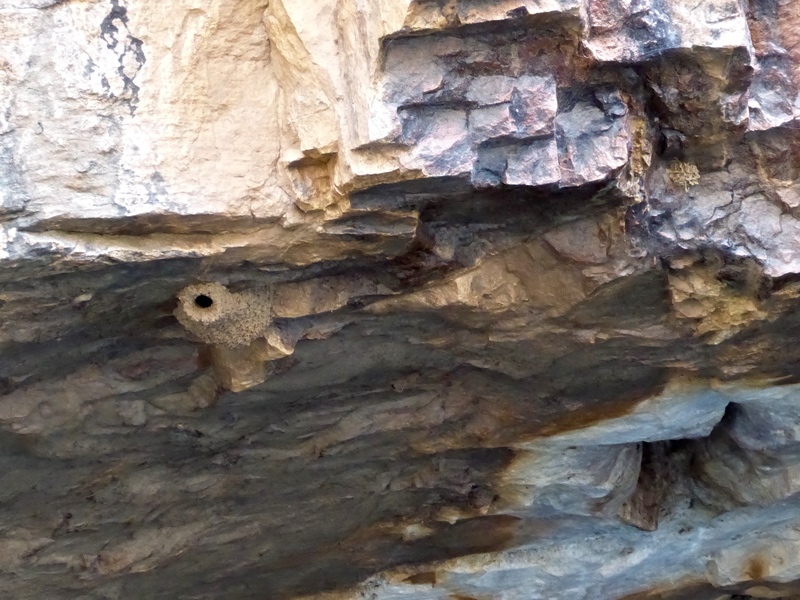 The uneven surface and holes or small caves, make the rock more interesting and mysterious to us. 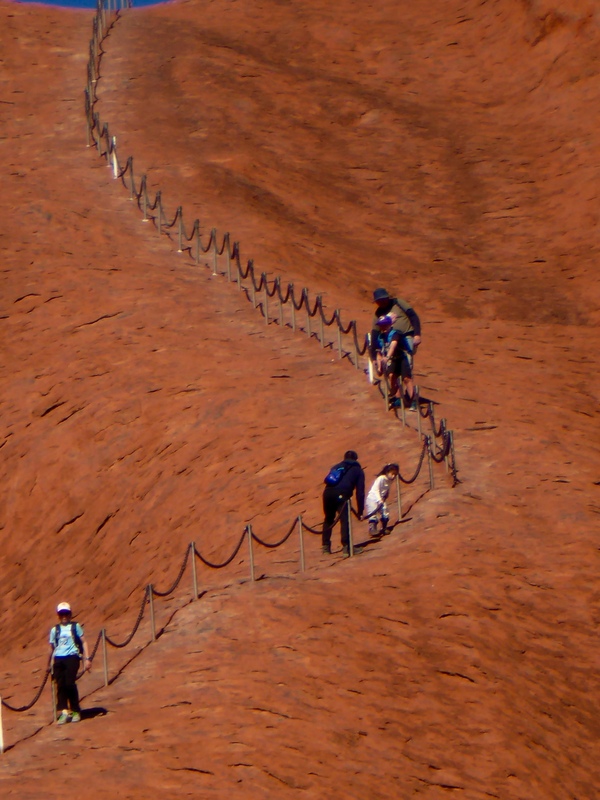 Many humans walk round the rock,and many climb Uluru. 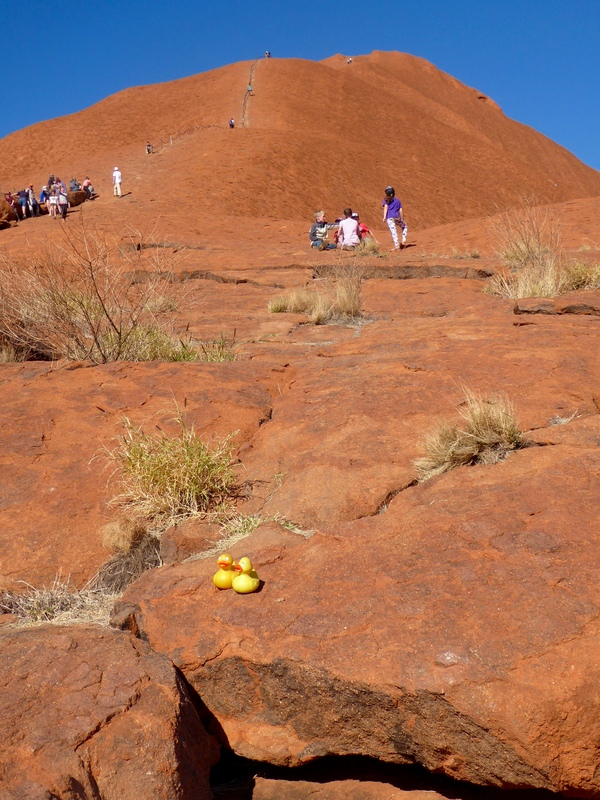 Climbing Uluru can be dangerous and the native aboriginal people ask you not to climb their sacred sites. 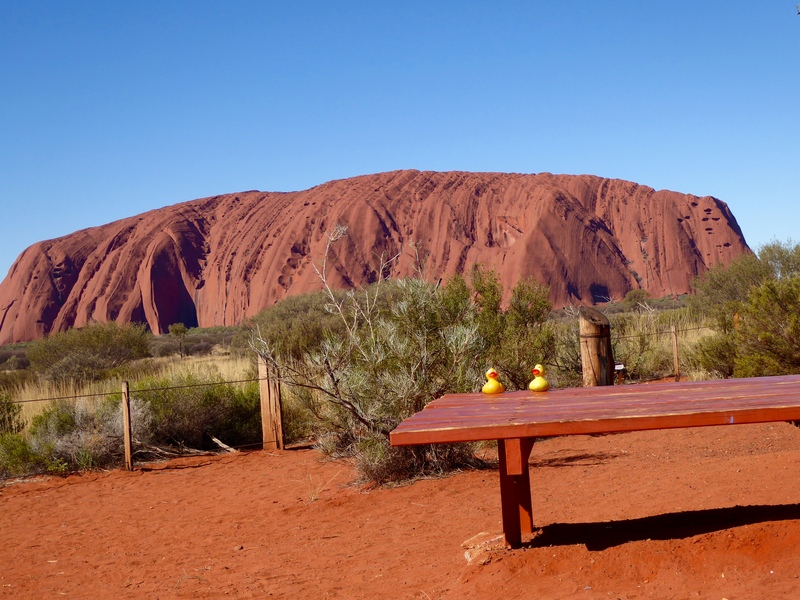 We sat here close to the ground, but we did not climb Uluru. We did not climb. Just sat at bottom of rock. 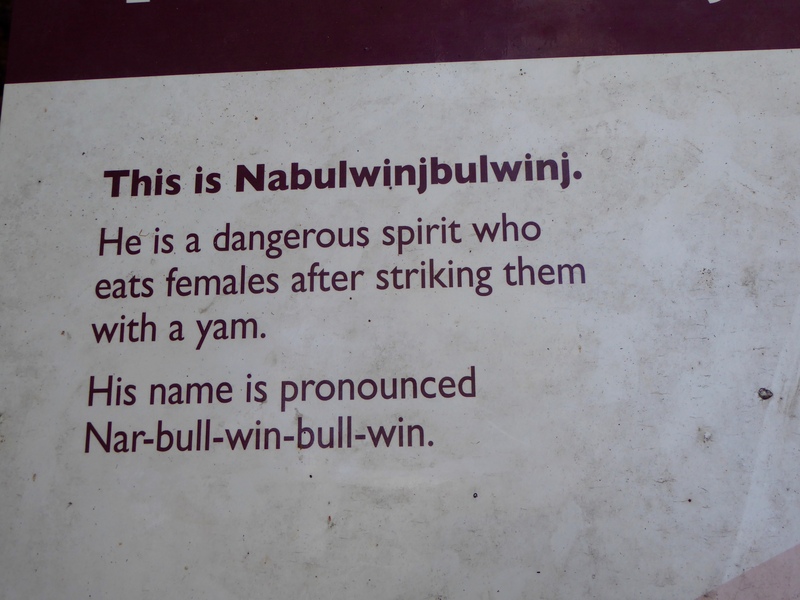 Aboriginals request no climbing. It is very impressive to walk round the area, gazing at the 1,150 feet, or 350 meters of the giant monolith that is above ground. 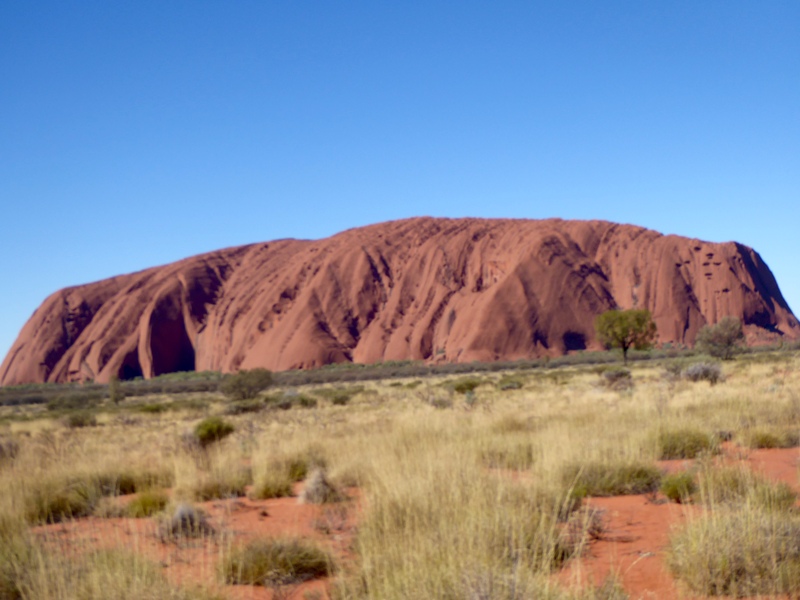 Geologists say that Uluru is the summit of a massive underground chunk of sandstone, about 600 million years old. 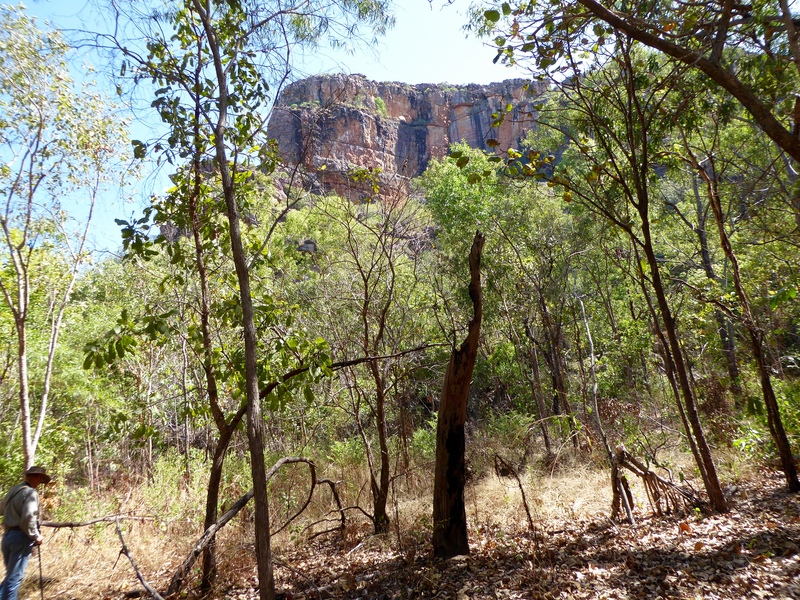 About 10% of the rock is visible. 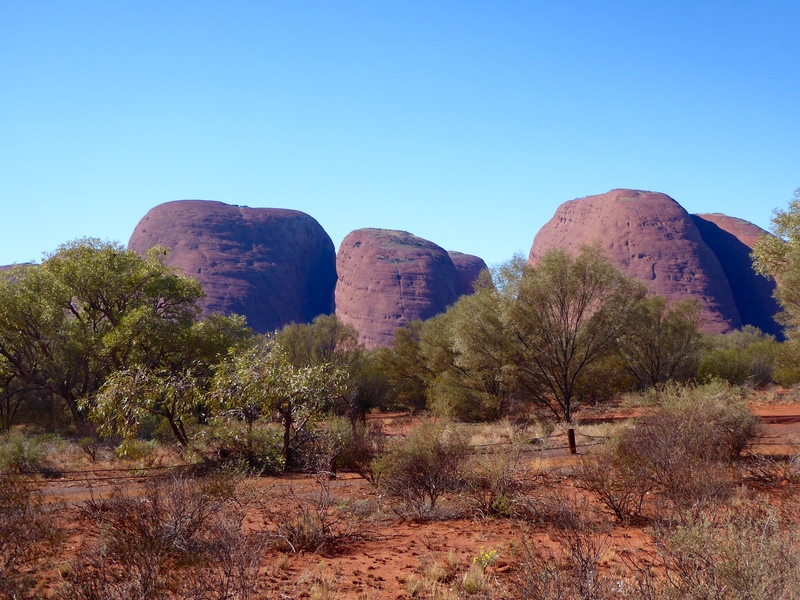 Next we drove 20 miles (32km) west to Kata Tjuta, or the Olgas. 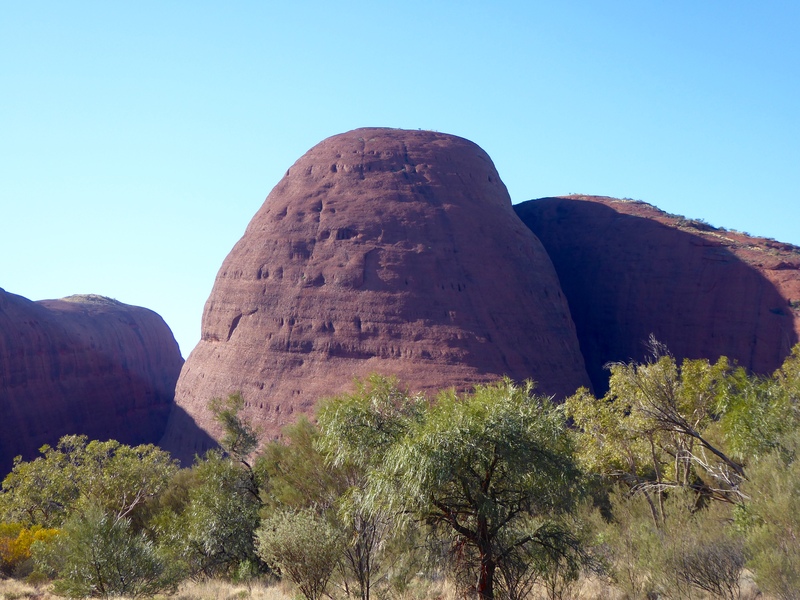 Kata Tjuta is a cluster of 36 sandstone and arkose (sedimentary rock formed from granite sands). The largest, Mount Olga, rises 1,800 feet (549 meters) above the ground. 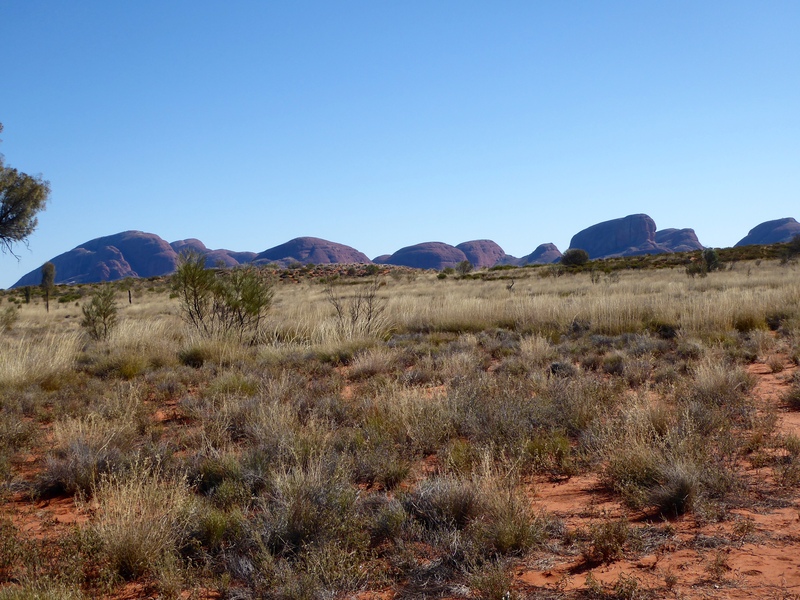 Scientists believe Kata Tjuta was part of a giant monolith about 10 times the size of Uluru. 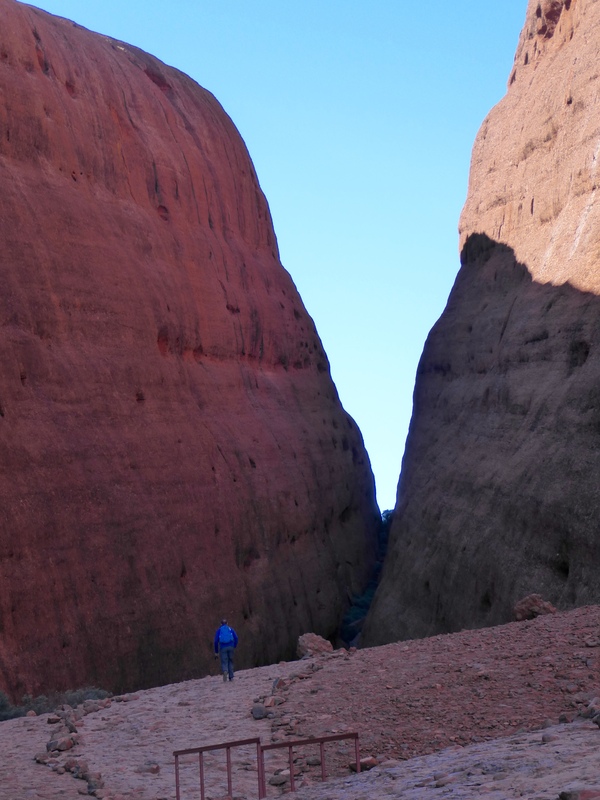 Kata Tjuta has fewer visitors than Uluru and there are no facilities or water available. Also, no climbing on the rocks is permitted There are several hikes around the rocks, but visitors must stay on the trails. The winds were pretty strong when we were there. 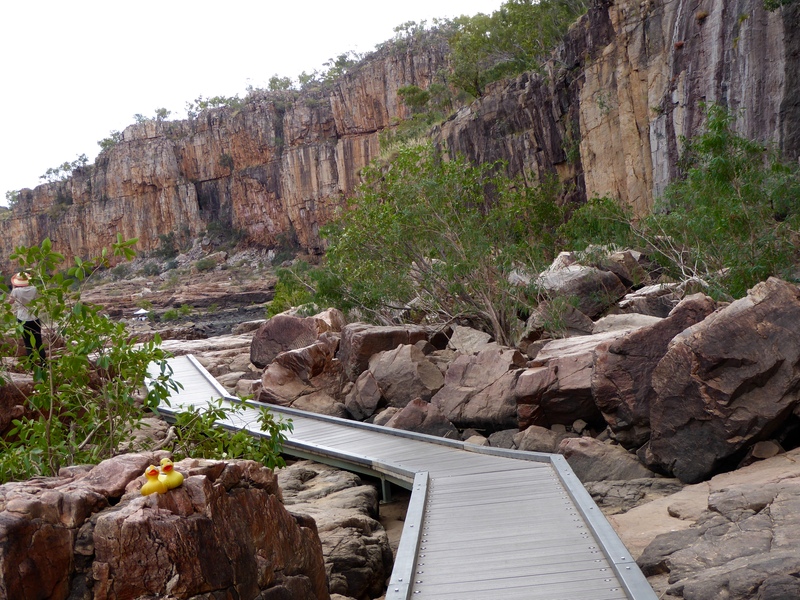 This is the trail to the Olga Gorge. It is quite windy now. People can hike to the gorge, but not climb on the rocks. 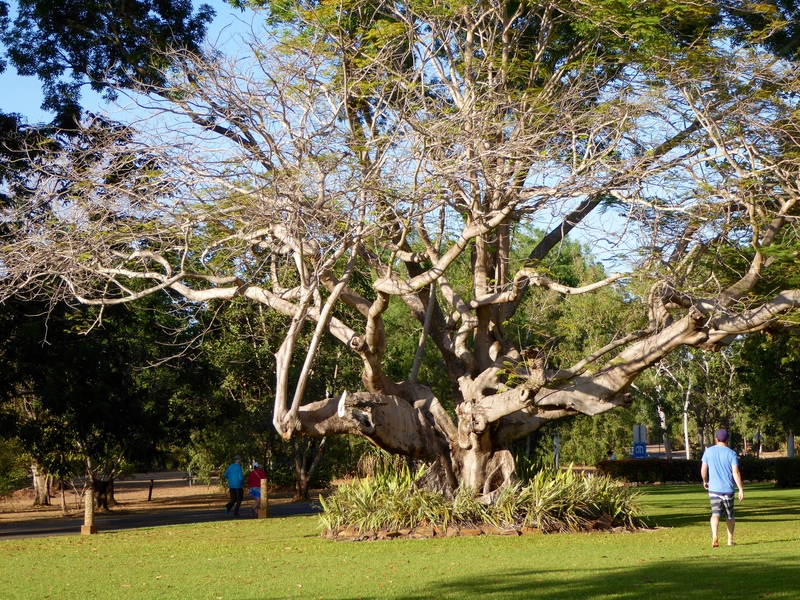 When you visit, we think you will really enjoy the park. 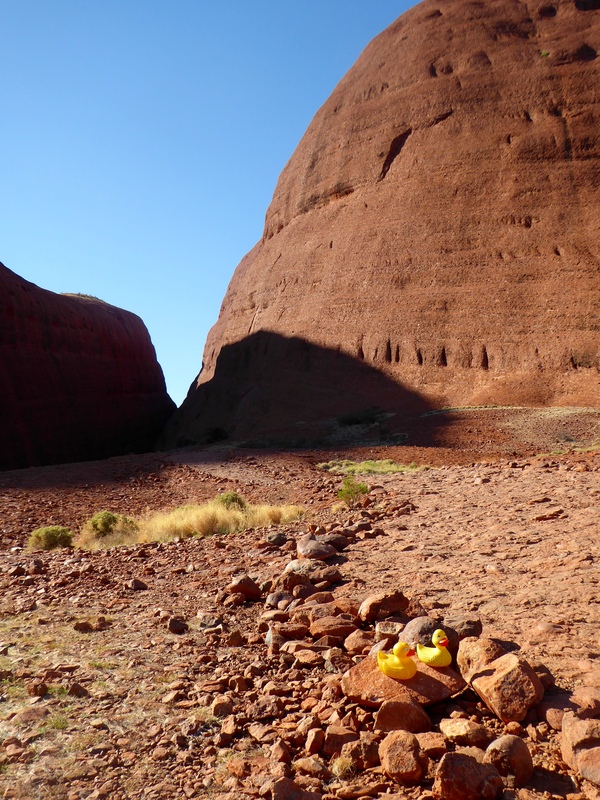 We also think you will take hundreds of photos of the rocks. Our humans did. 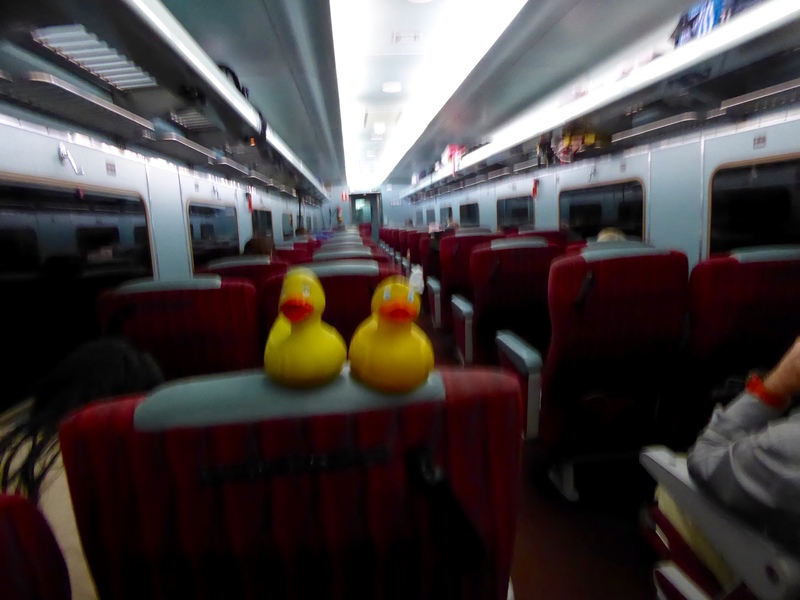 Zeb and Eider Duck are on another train. 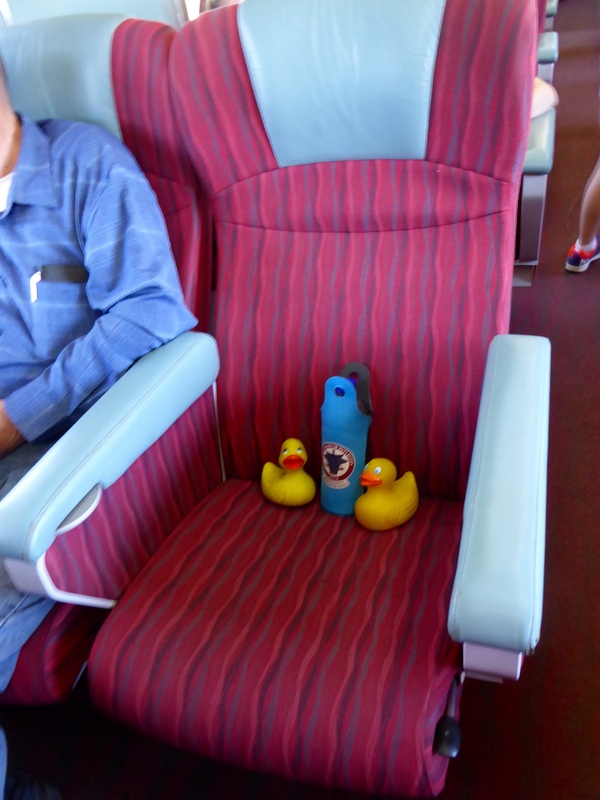 We had our first long train ride on Australia’s Indian Pacific, and now we are going on another one. 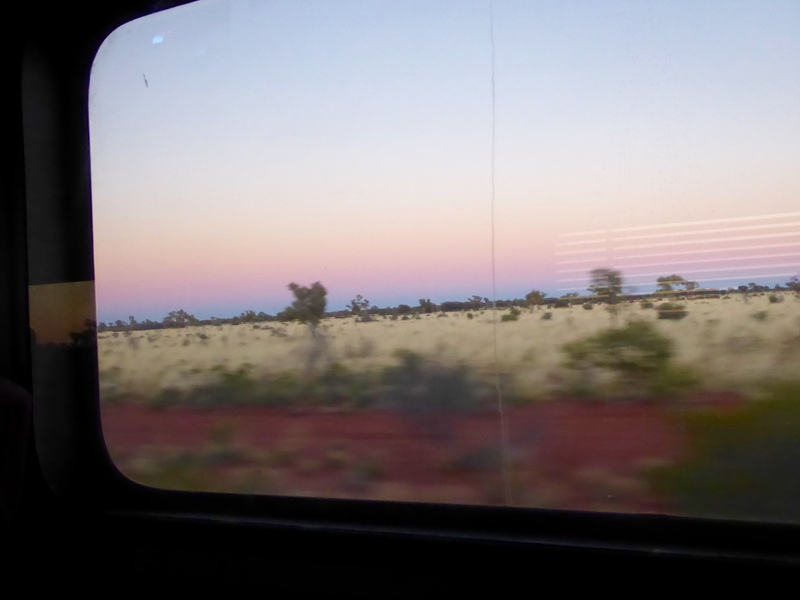 This is the Ghan. 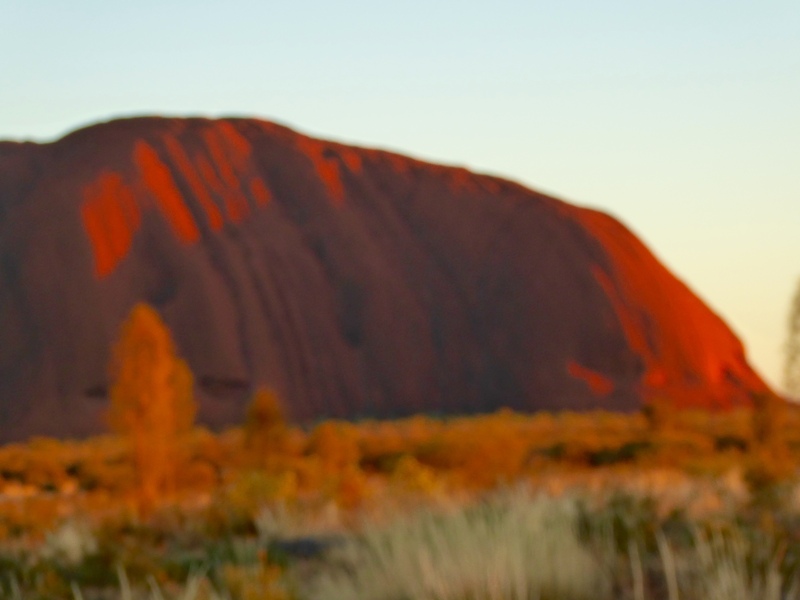 The Indian Pacific travels east and west, between the Indian and Pacific Oceans. 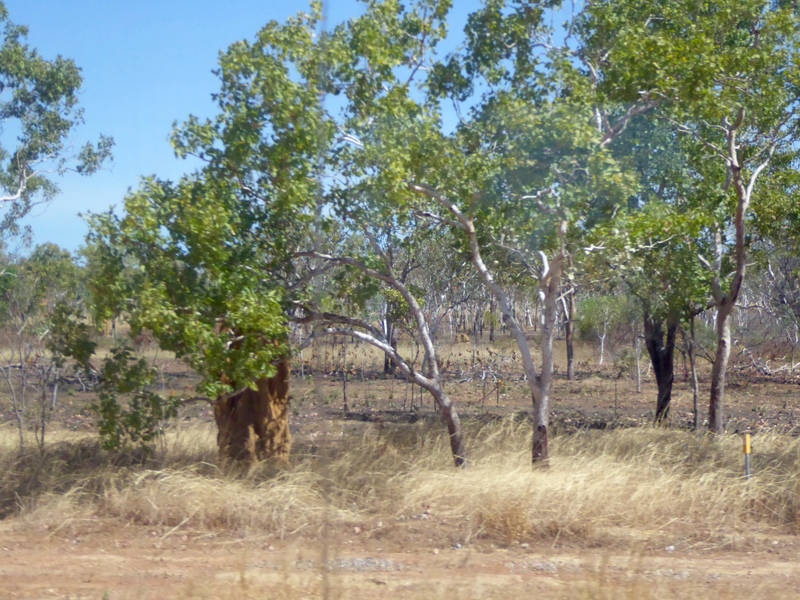 The Ghan travels north and south, connecting Darwin with Adelaide. 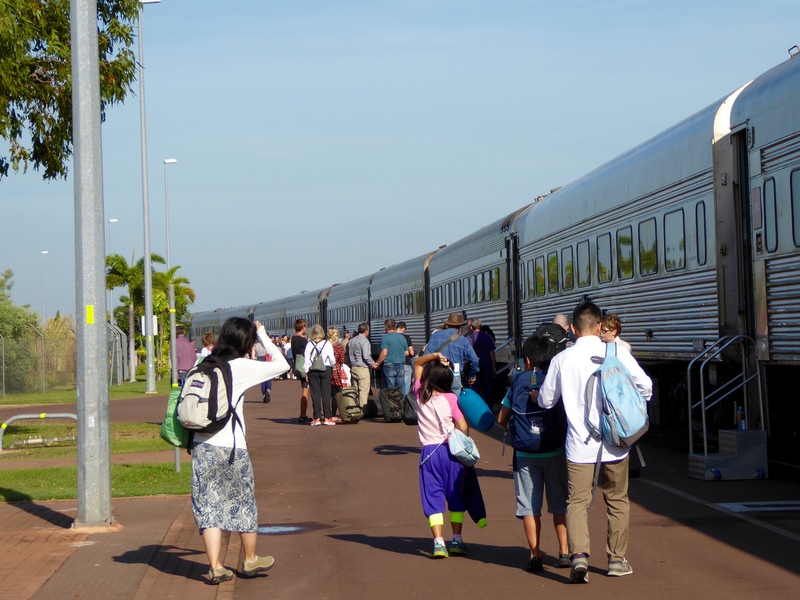 We are getting on the train in Darwin, in Australia’s Northern Territory. 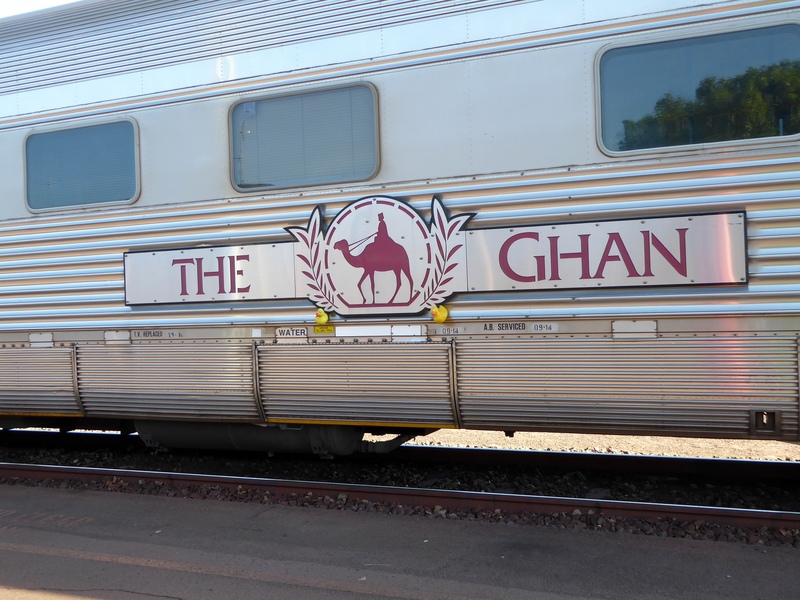 The Ghan is named for the Afghan camel drivers that worked in Australia building the telegraph system. That is why we have a camel emblem on the side of our train car. People are still getting on the train. People are loading our luggage on the train. The luggage goes on the train. We can only have hand luggage with us. Larry, the safety manager, said that we have about 36 cars on our train. We also have train cars with automobiles. Some people are bringing their personal vehicles with them. We, of course, retuned our rental car and our personal vehicles are in Colorado and Alaska, so no car for us. Soon we crossed the Elizabeth River. 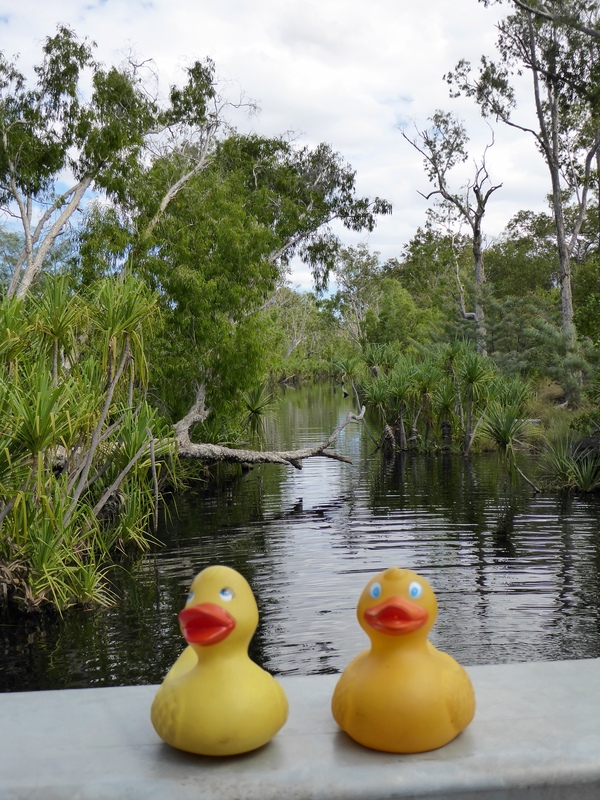 This is one of Australia’s most important rivers. 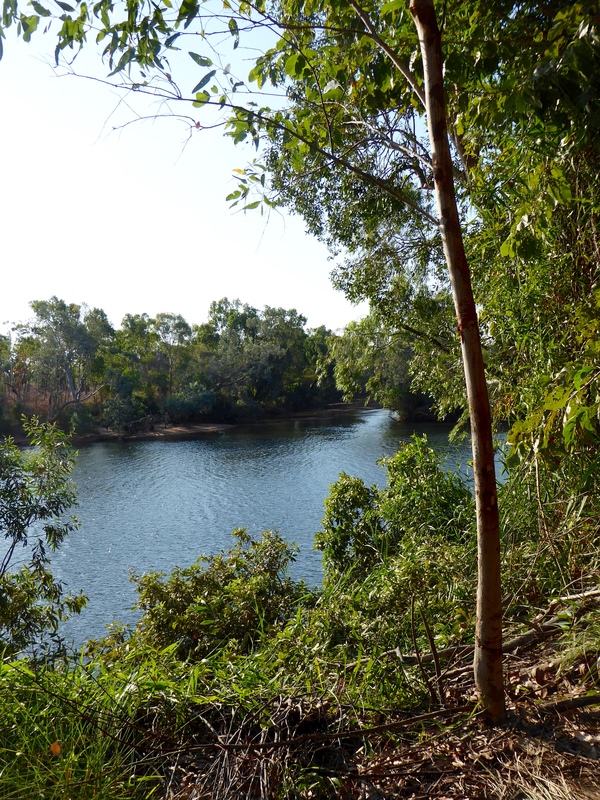 This is a view as we approach the town of Adelaide River. 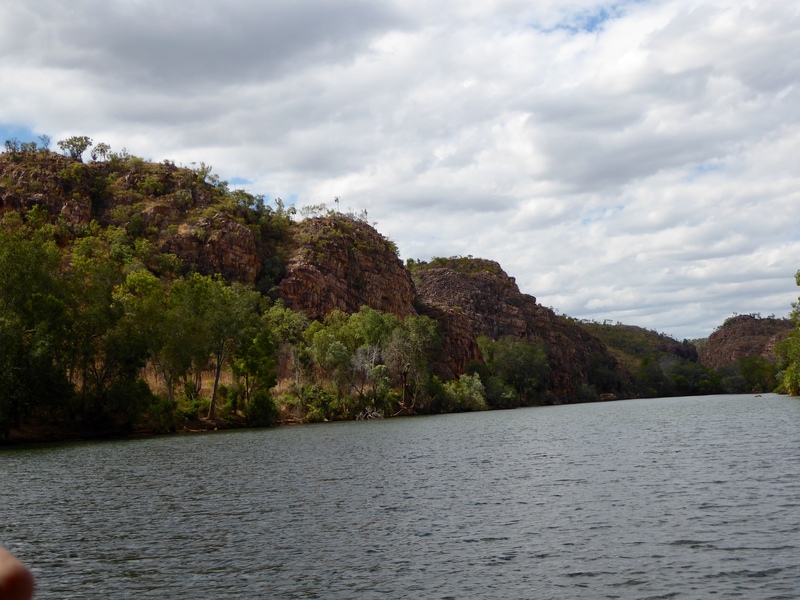 Approaching town of Adelaide River. 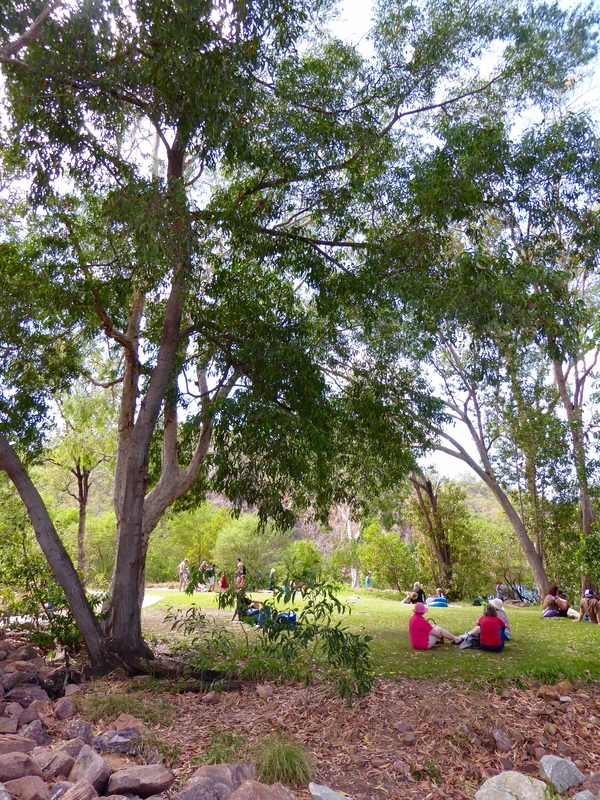 Much open space and many trees. 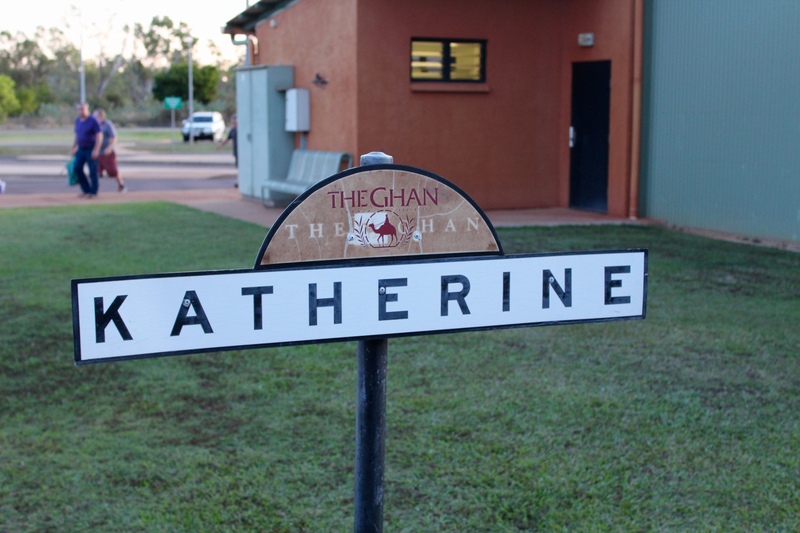 The Ghan stops in Katherine. We stay here for a couple hours. 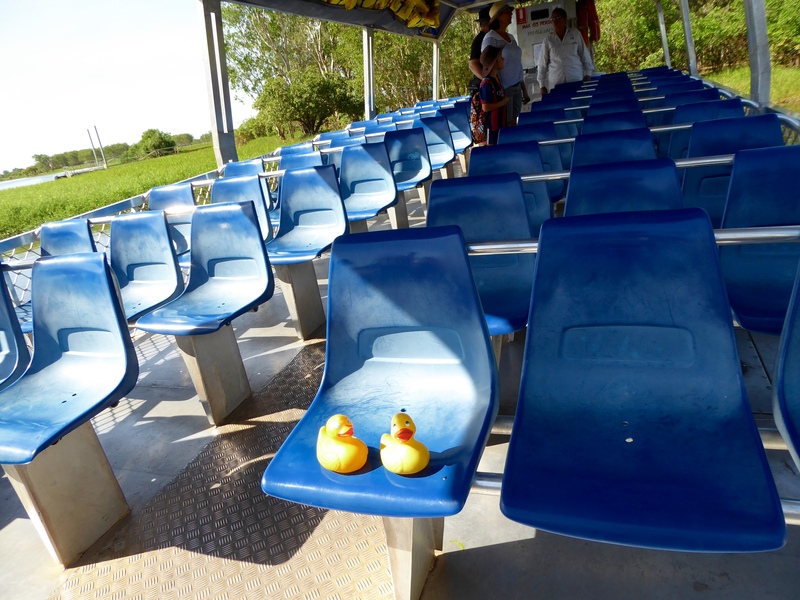 Eider’s dad took a shuttle into Katherine. 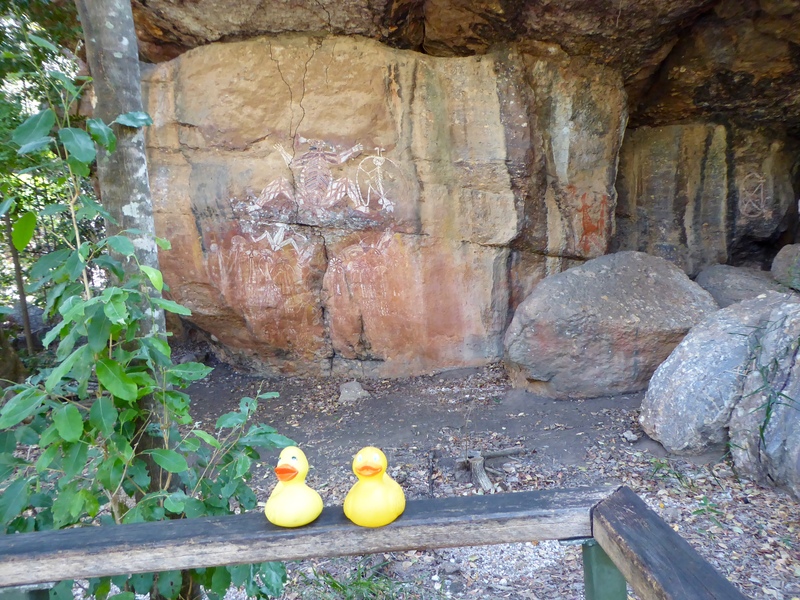 Zeb’s mom took Zeb and Eider into Nitmiluk Park again. We were here before, but it is very pretty. 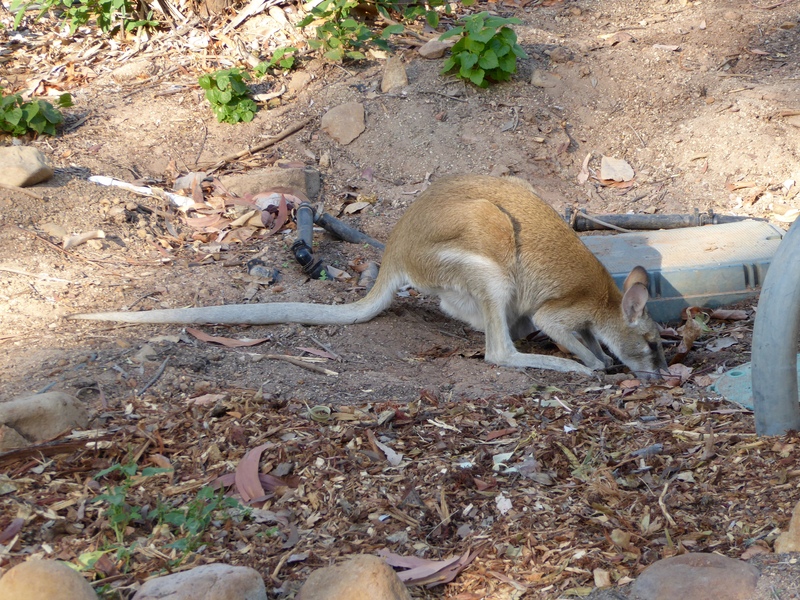 As we approached the Visitor’s Center, this wallaby was busy and did not pay attention to the tourists taking her photo. Wallabies look like small kangaroos. We like this wallaby. 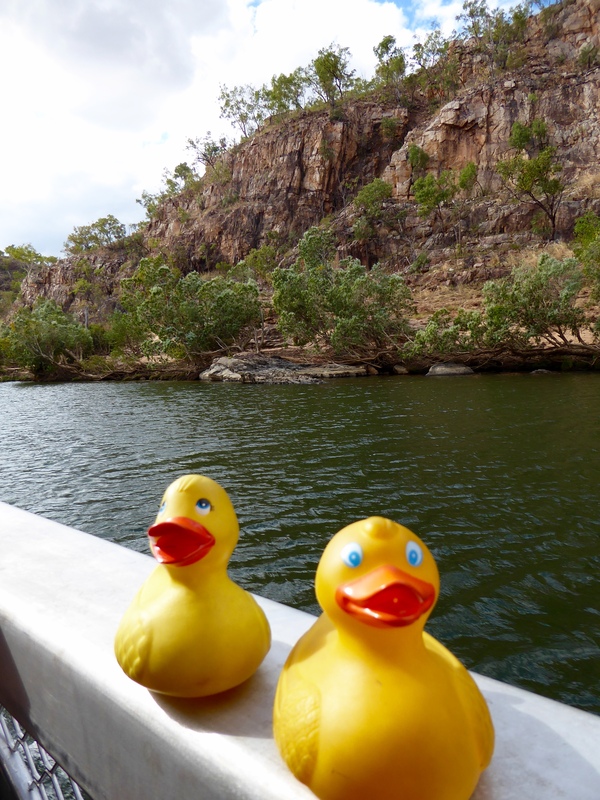 Some passengers on the Ghan took a short version of the cruise we enjoyed through the gorges. We did a little hiking. Back on the Ghan, we wanted to show you the inside of train passenger car. The dining car looked like the one we showed you on the Indian Pacific train. In the morning the landscape had changed. 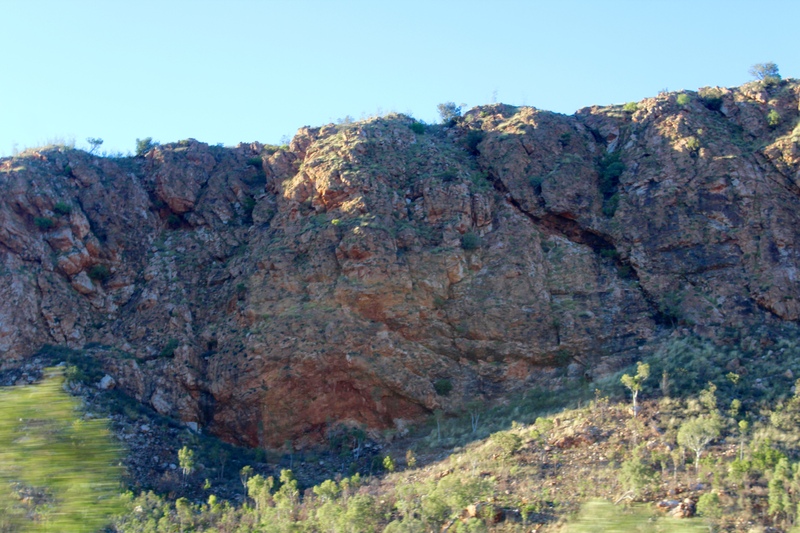 As we approached Alice Springs, in the center of Australia, the dirt is red and we are entering desert areas. 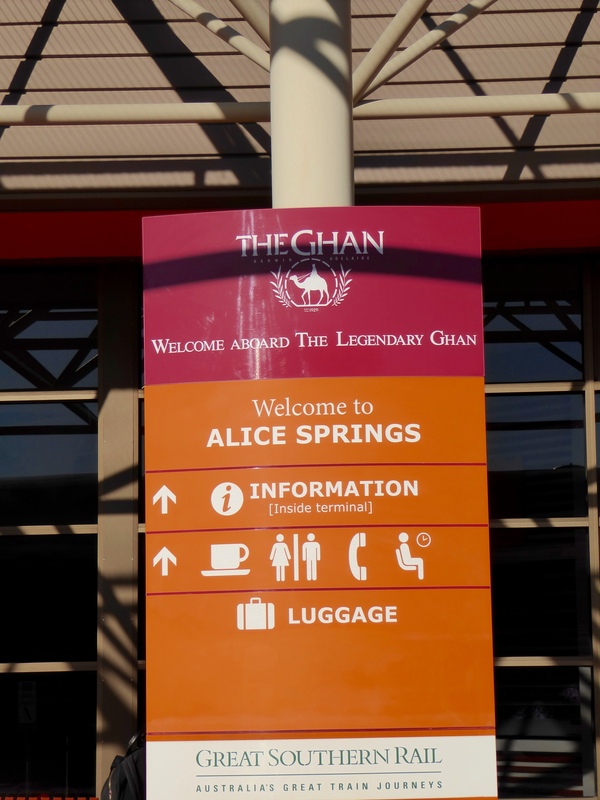 We arrive in Alice Springs. 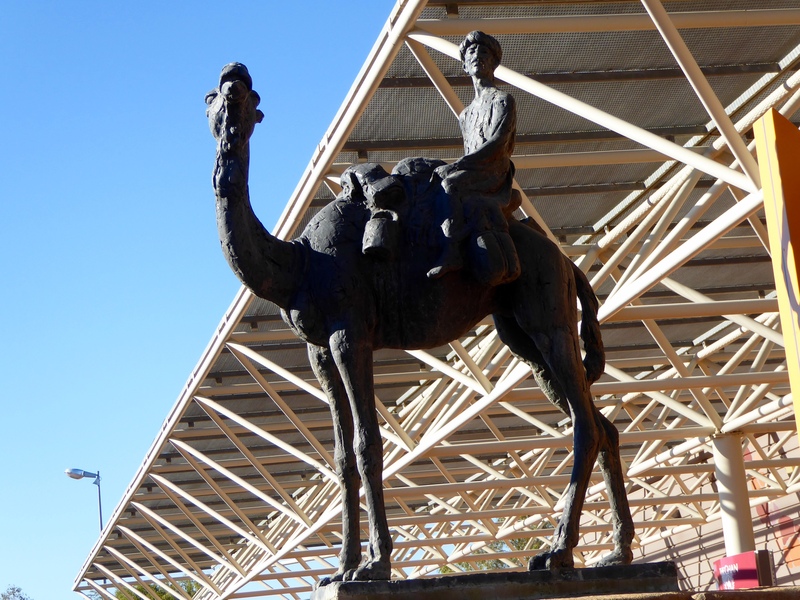 This camel statue is here to welcome all the passengers to Alice Springs. 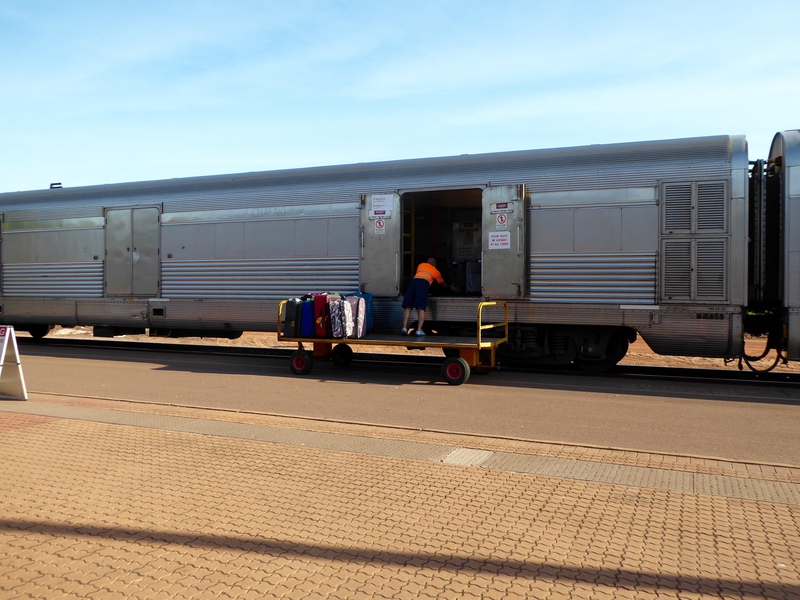 We are leaving the train here and flying to Ayers Rock Airport where we will see Uluru, or Ayers Rock. In the airport, we visited the restroom. 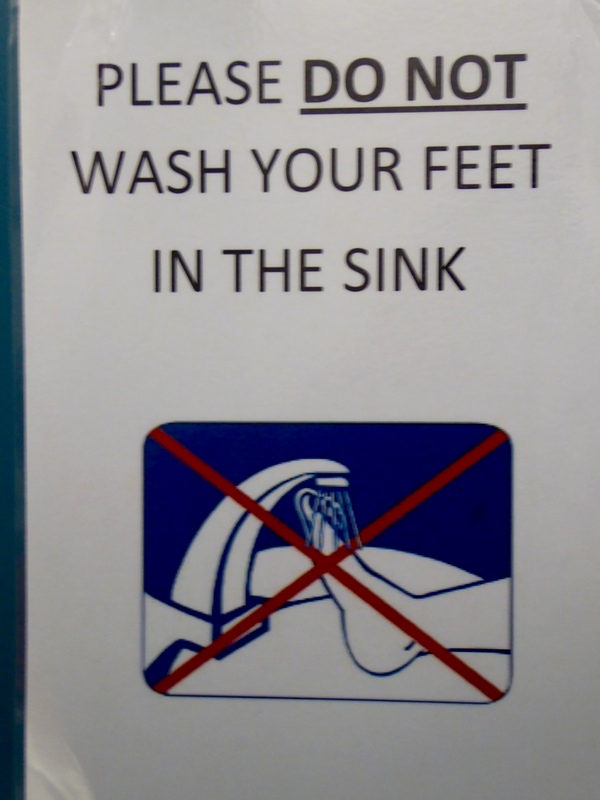 This was a new sign for us. 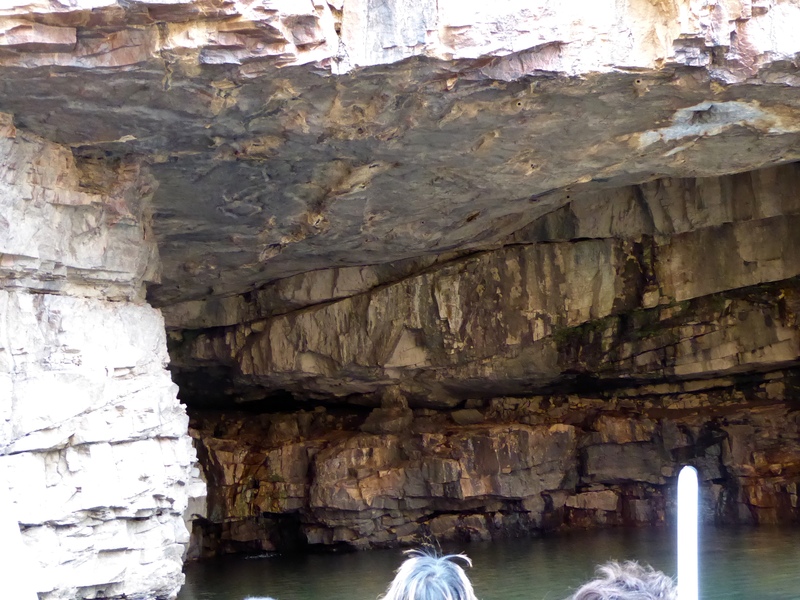 We liked our Australian train trips. We hope you travel by train there, too. 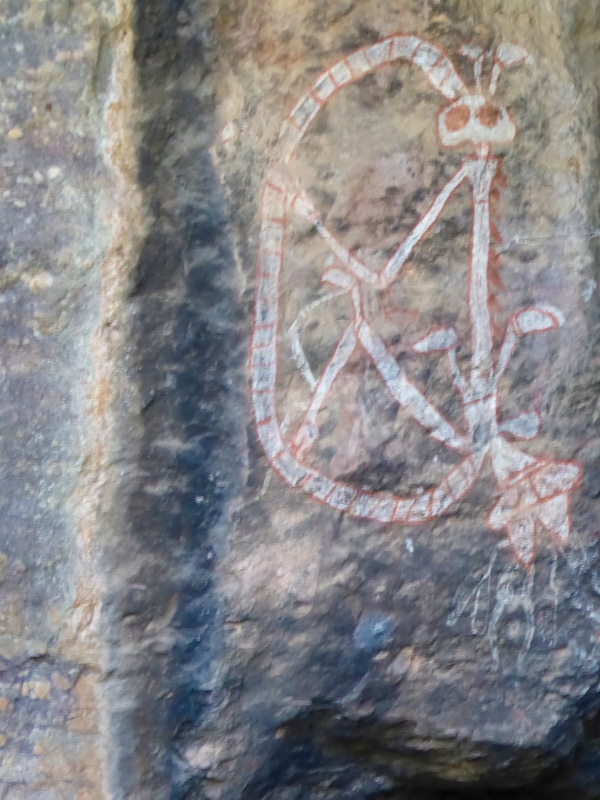 to see some Aboriginal Rock Art. 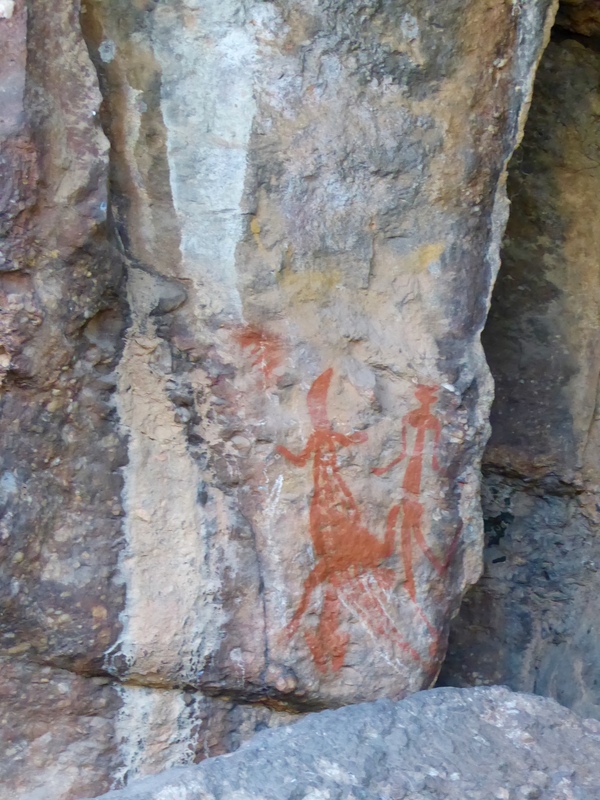 Our National Geographic guide book says humans were here more than 20,000 years ago. This sign explains what we are seeing. This one is also interesting. Now we are getting on another boat. We love these boat rides. There are so many of these brown, wood ducks. 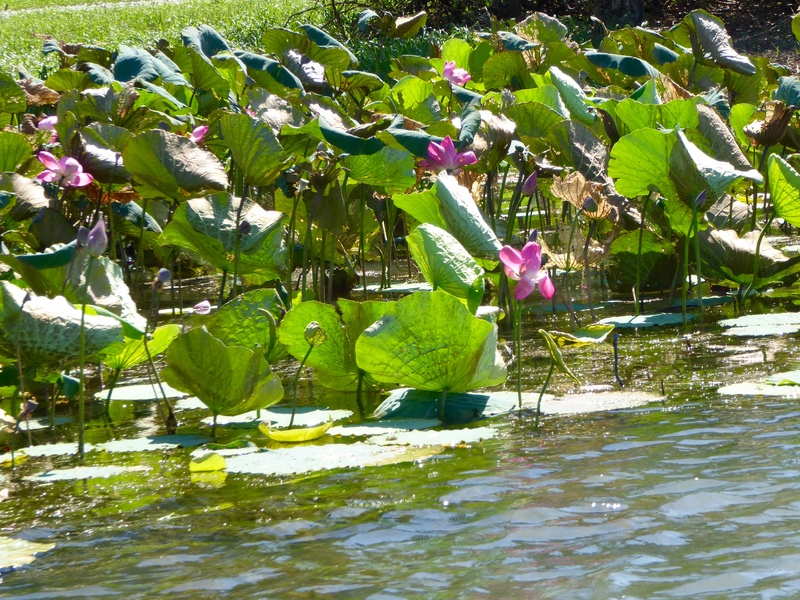 Aren’t these flowers in the lily pads beautiful? We really like them. 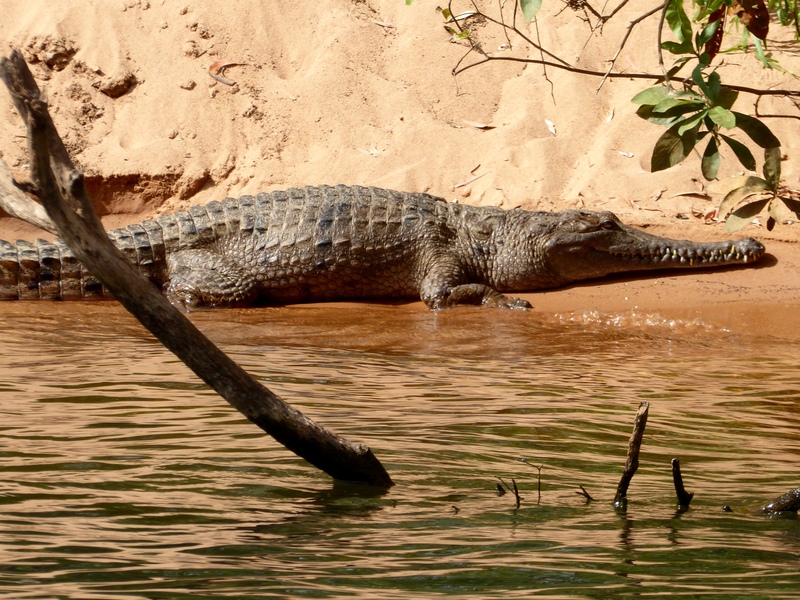 Kakadu National Park is home to both salt water and fresh water crocodiles. 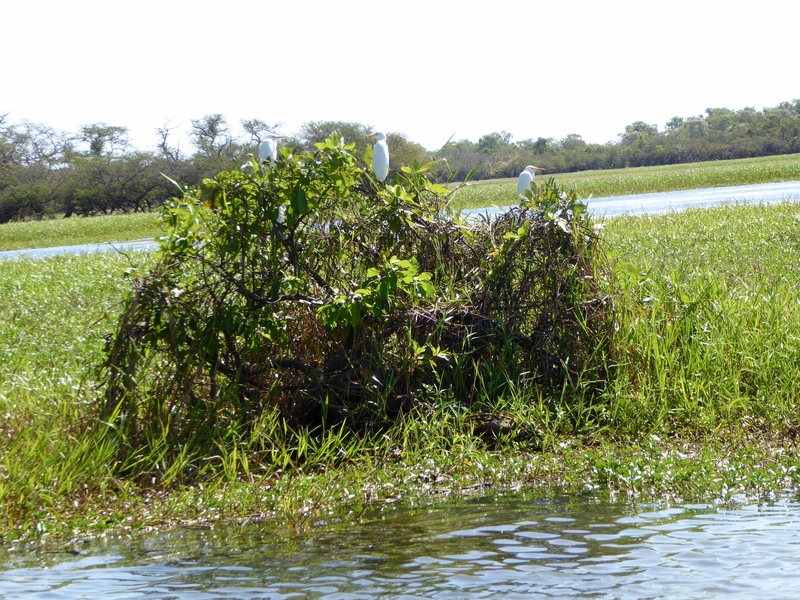 We believe this is a fresh water crocodile. 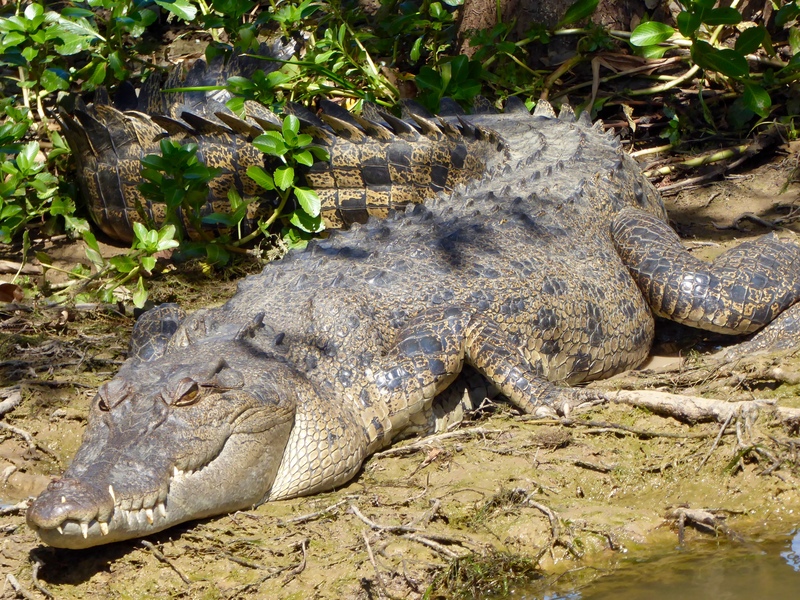 A really big crocodile at Kakadu enjoying the sun. This bird seems to be looking for a snack. 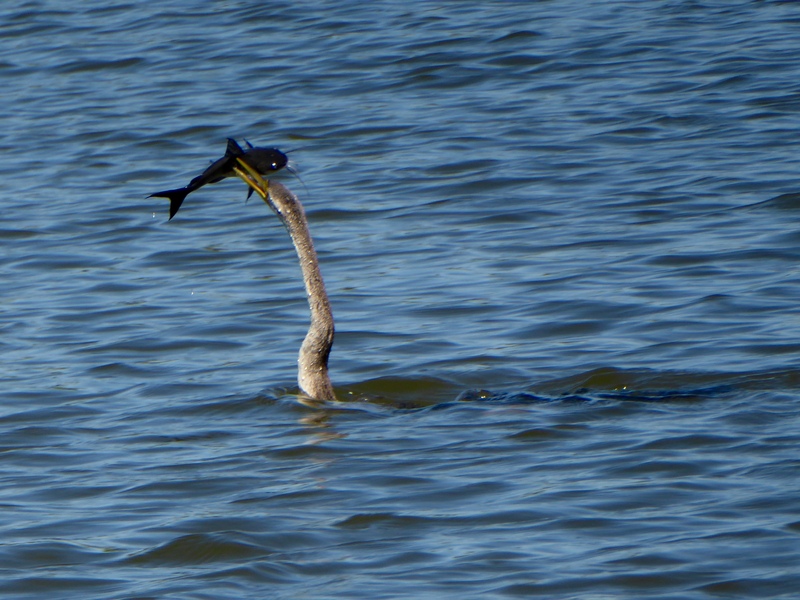 He caught a fish and is trying to position the fish so he can eat now. 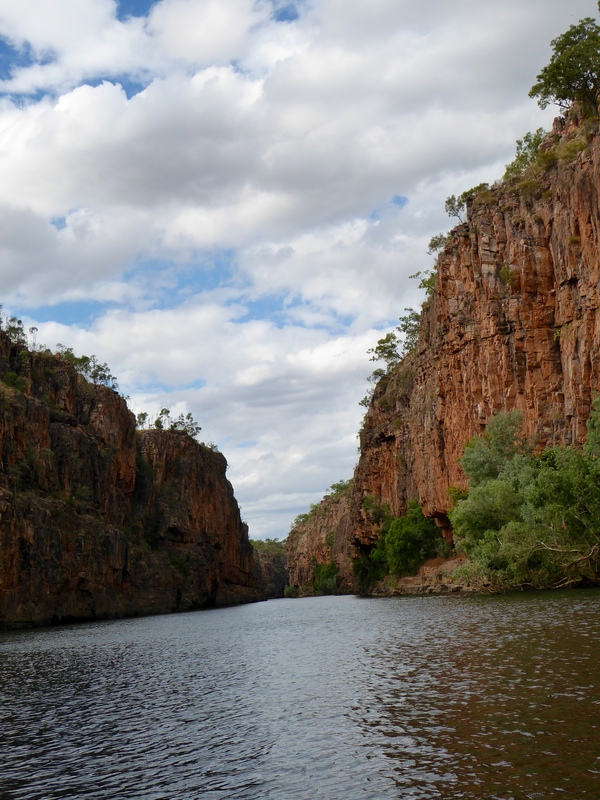 Kakadu National Park has 290 species of birds and 74 species of reptiles. 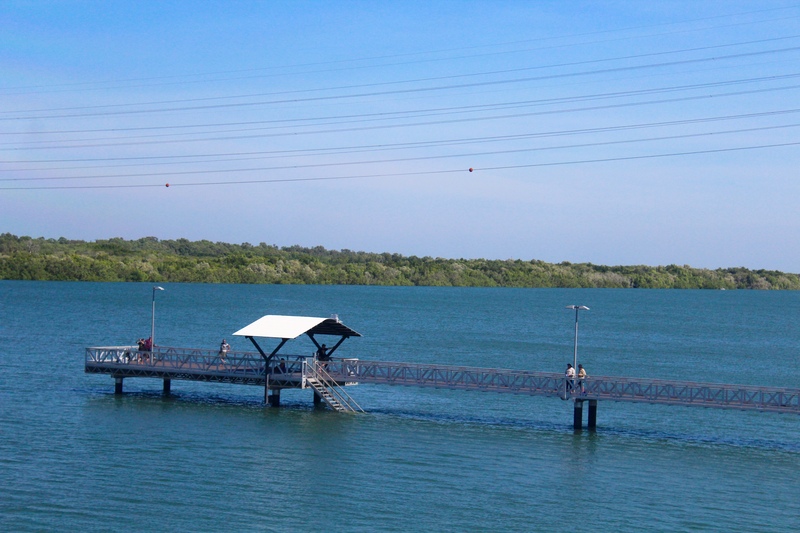 There are also more than 1,600 species of plants and over 52 different types of fish. Today we saw so many birds. These white birds are great. 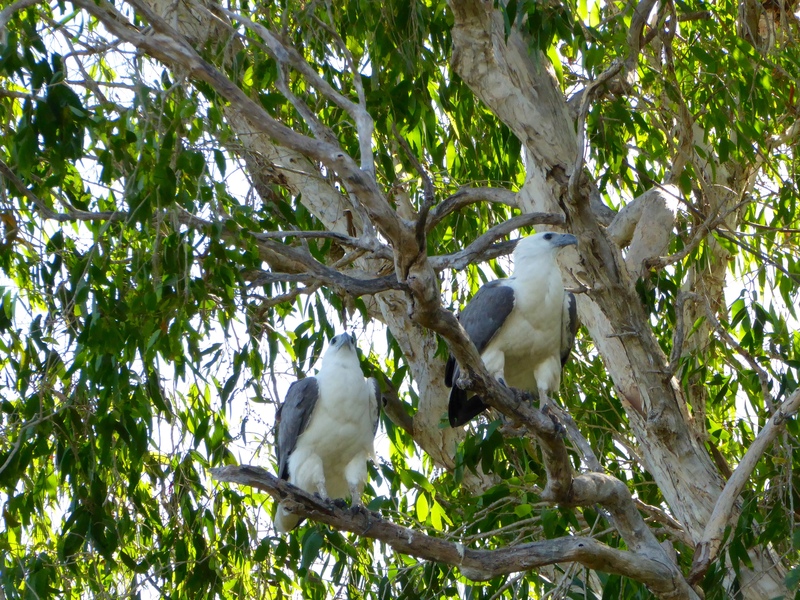 These white and grayish blue birds are also wonderful. 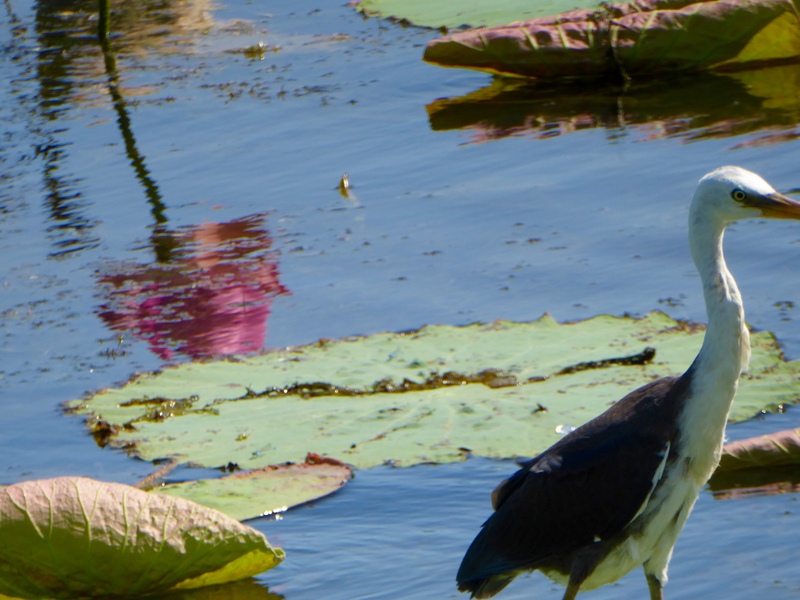 We really like their beaks. 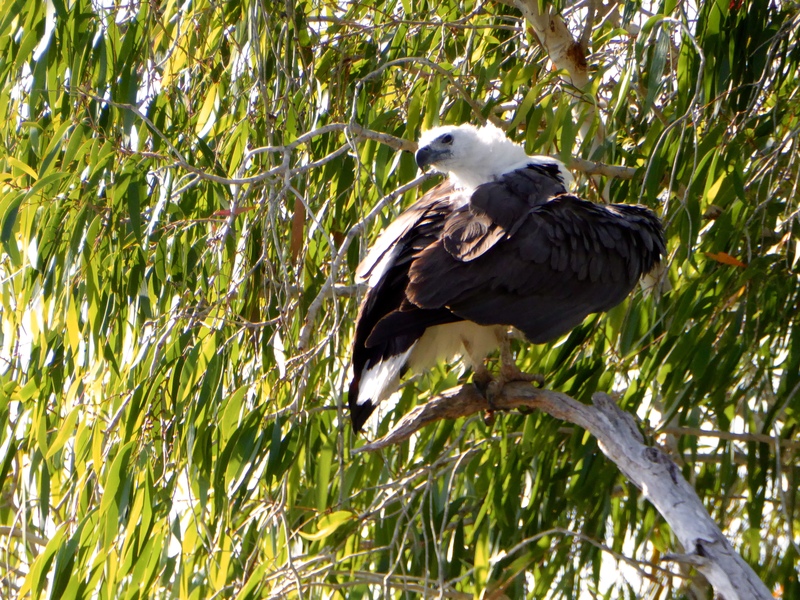 This looks like a type of eagle. 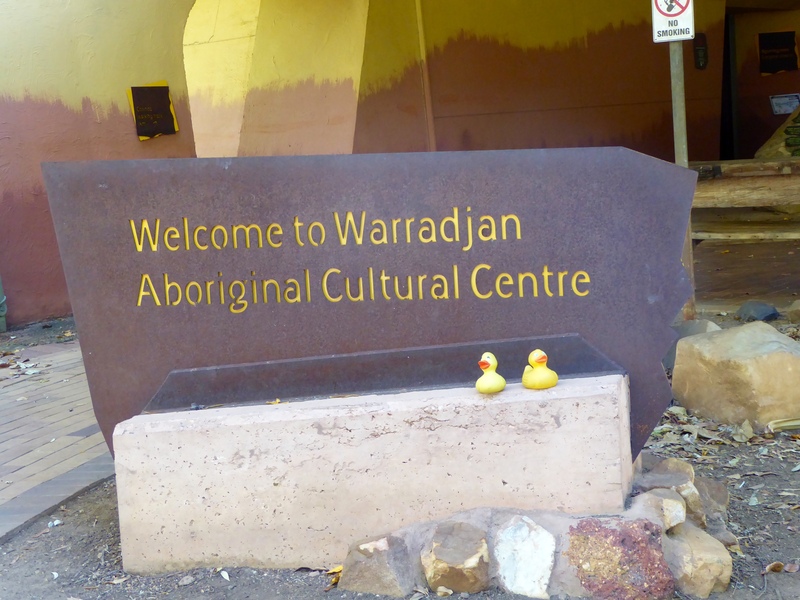 After our boat trip, we visited the Warradjan Aboriginal Culture Center. 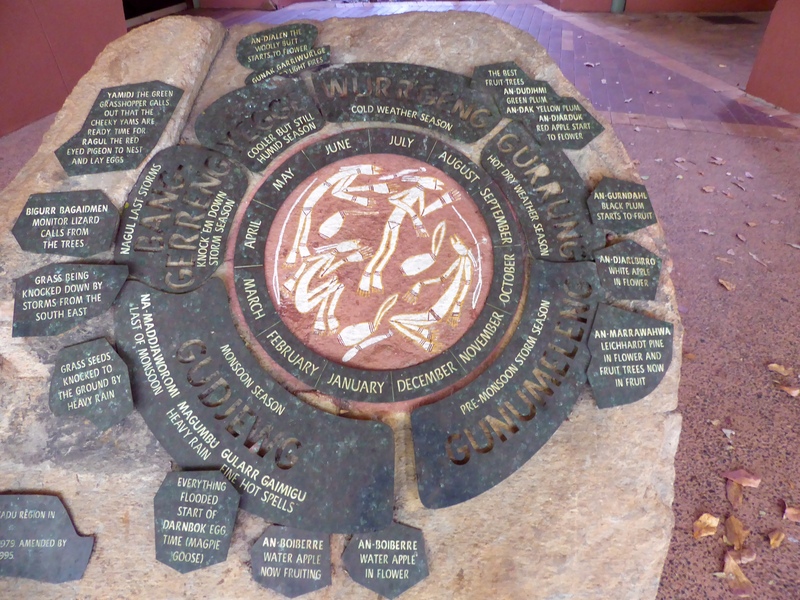 The aboriginal calendar at Kakadu shows 6 seasons. Six seasons here. 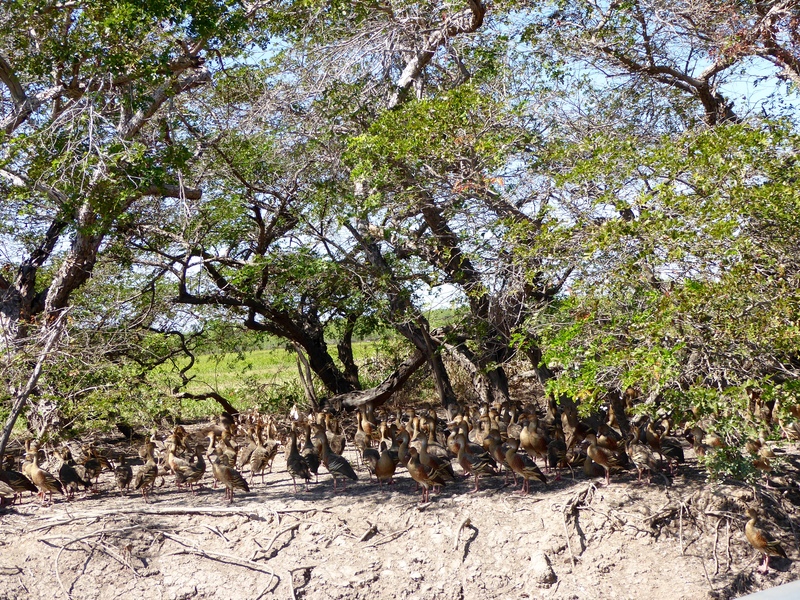 We are enjoying the dry season. The cultural center was very interesting, but photos were not allowed in many exhibits. 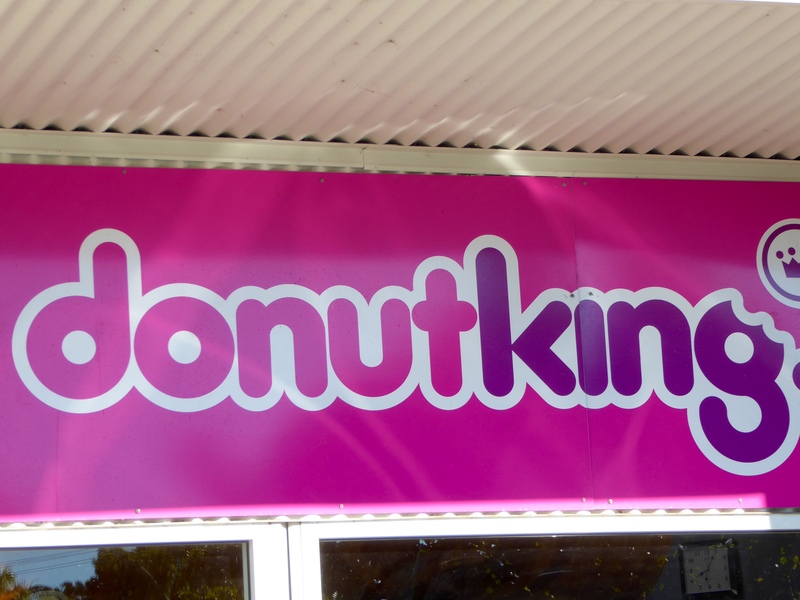 If you go, we think you would enjoy the center. 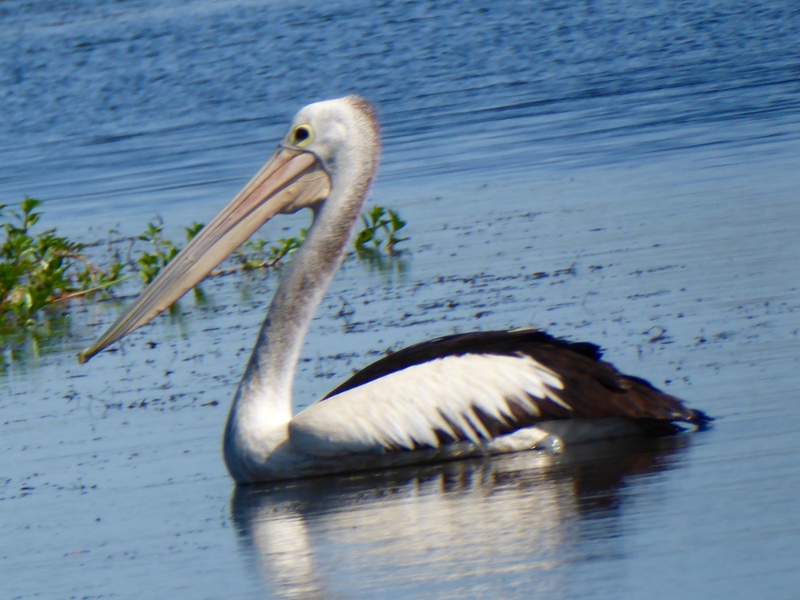 Before we leave Kakadu National Park, we want to remind you that no boat ride here would be complete without a pelican. 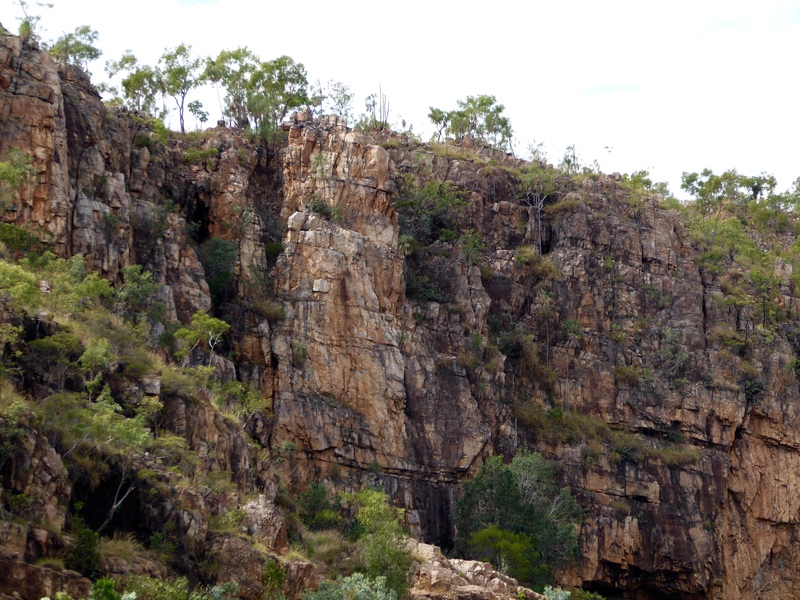 Australia’s Northern Territory is so wild and seems to be as it was thousands of years ago. 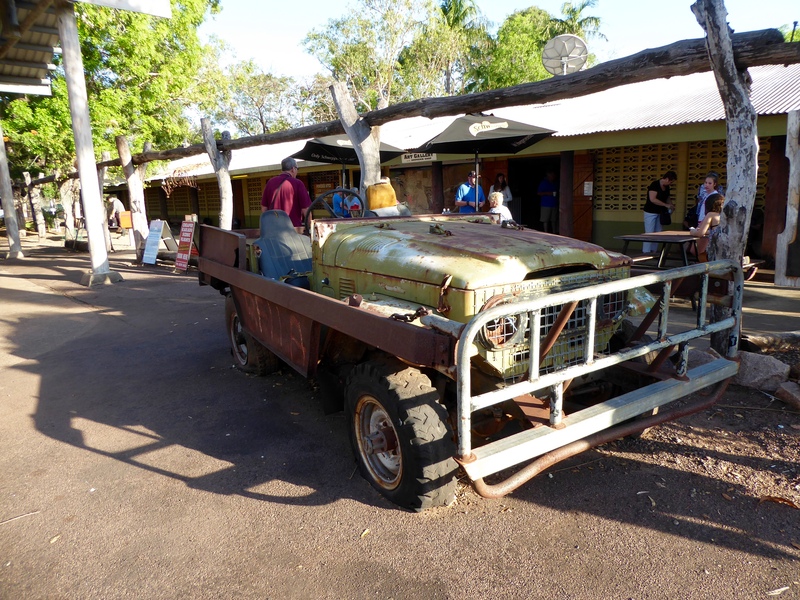 When you go, you will feel the difference in the Northern Territory. We did. 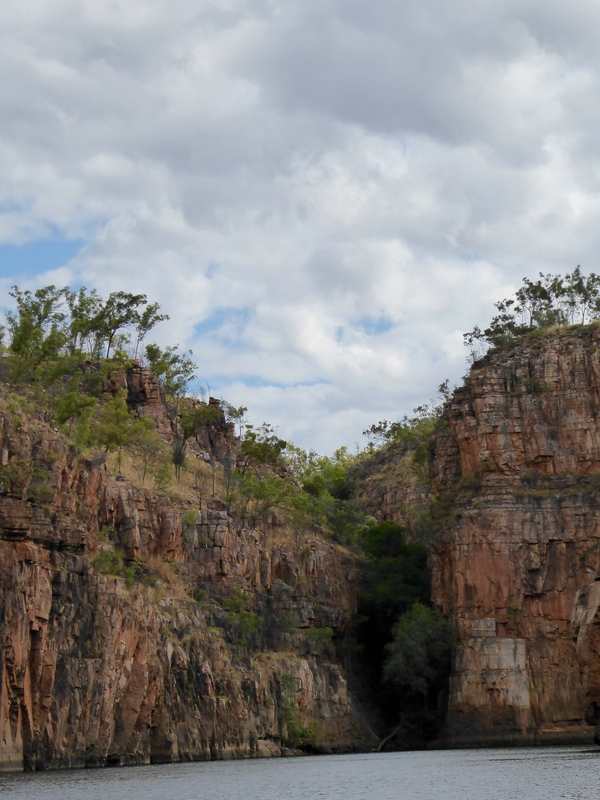 There are two major roads through the Kimberley of Australia. 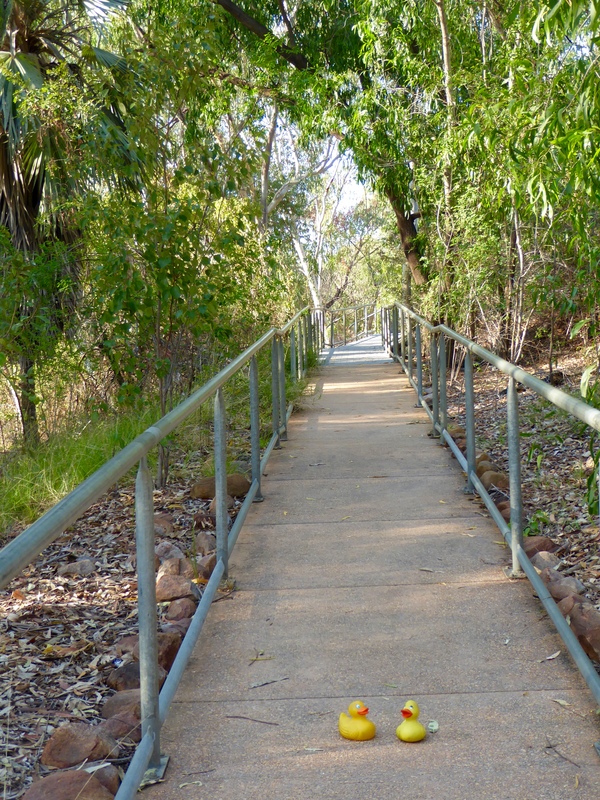 This part of Australia has little or no access during The Wet, or rainy season. Flooding frequently closes the roads. 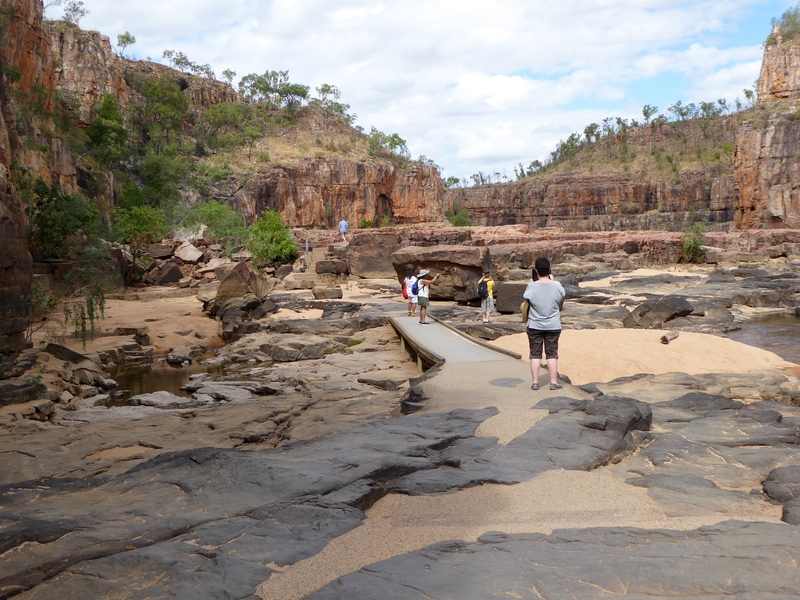 We drove to Derby earlier and took a couple day tour in the Kimberley, but we wanted to see more. 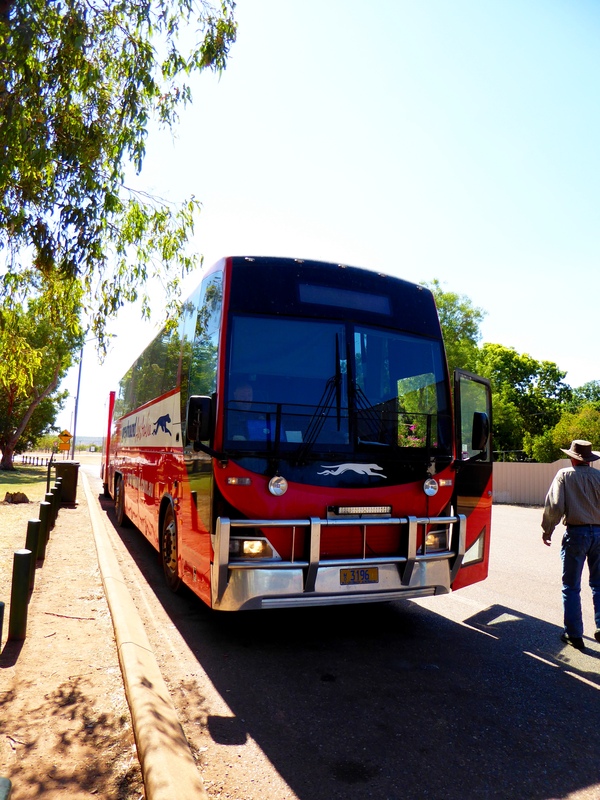 We took a Greyhound Bus from Broome, Western Australia, to Darwin, in the Northern Territory. 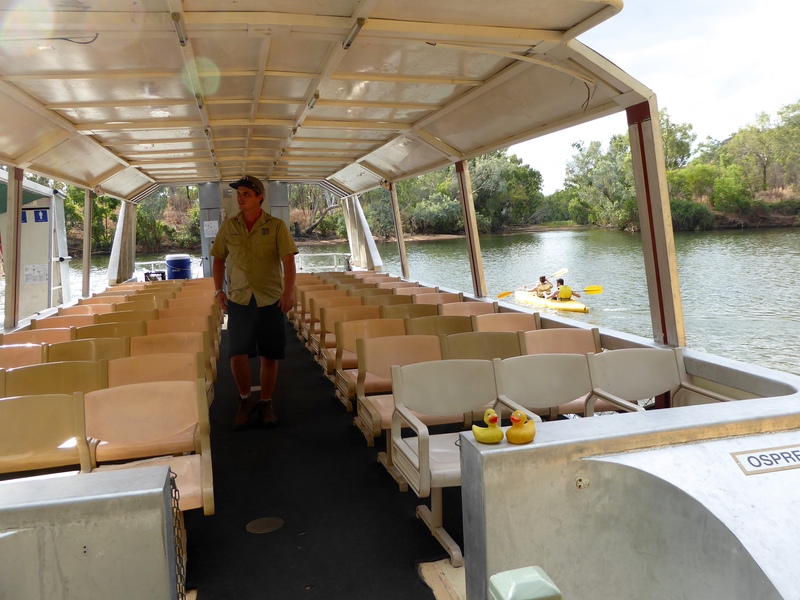 We also took bus tours to Nitmiluk National Park and to Kakadu National Park. 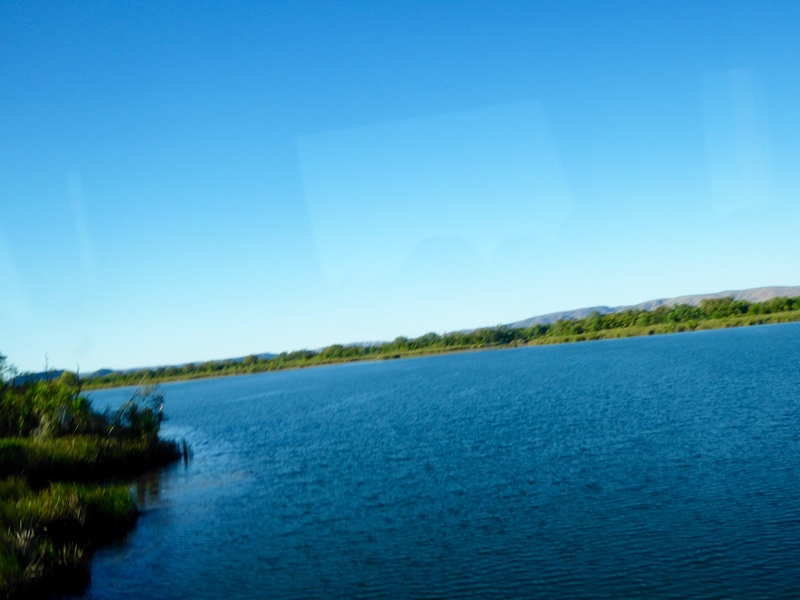 Today we will show you some of what we saw from the bus. 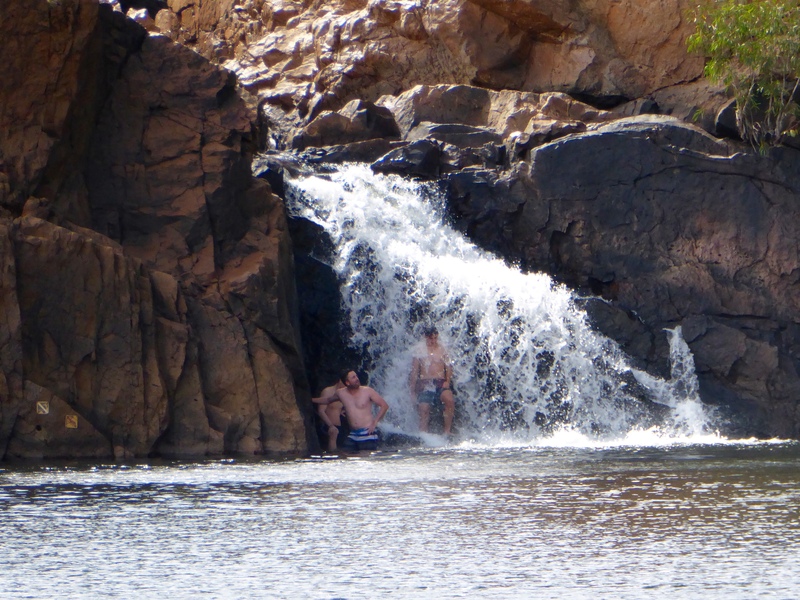 We already showed you Derby, and our Kimberley Wild Tour. 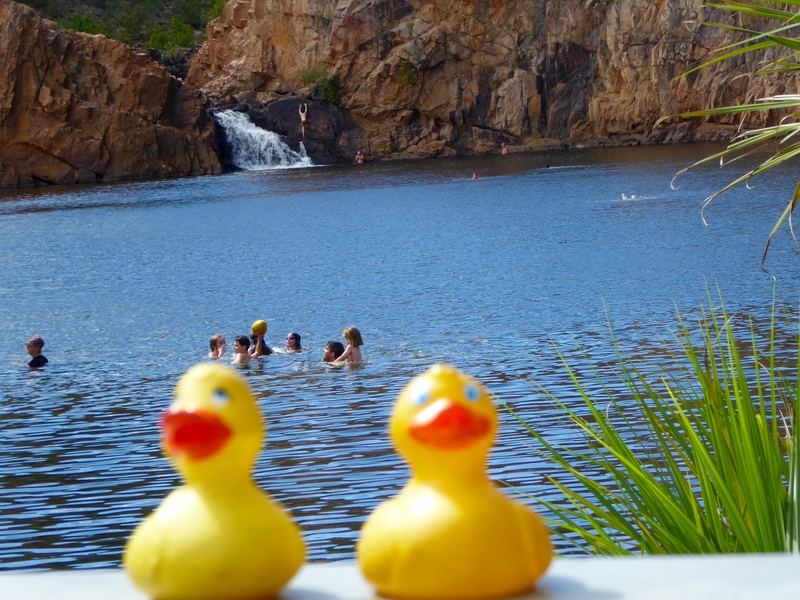 Soon we will show you parts of Nitmiluk National Park and also Kakadu National Park. 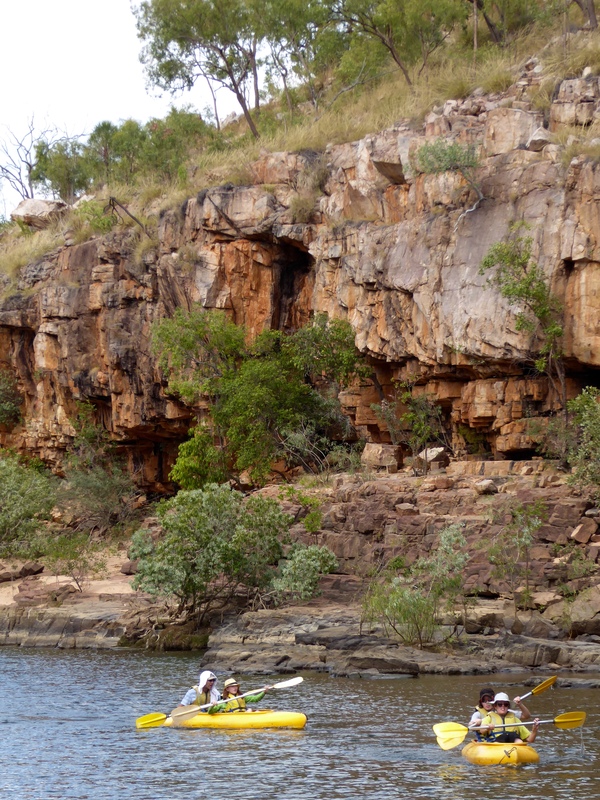 Through the Kimberley, we crossed several rivers. 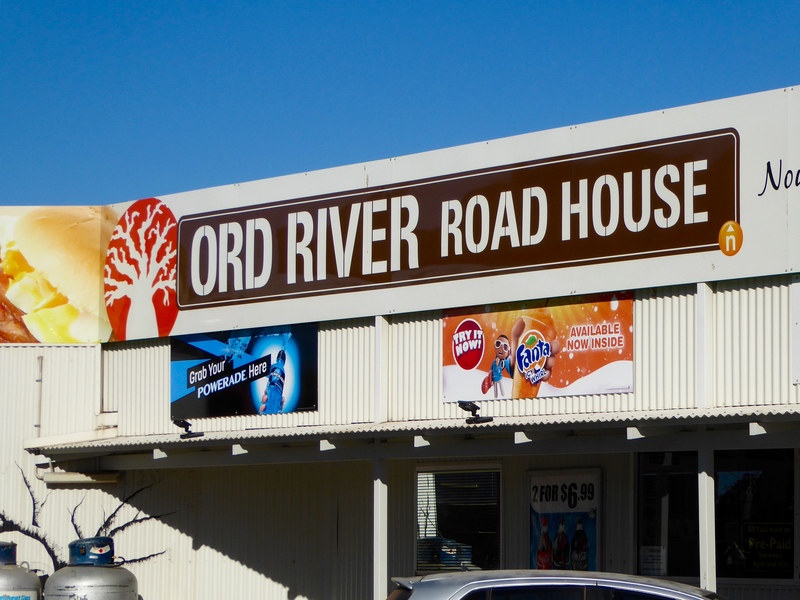 We also stopped at the Ord River Roadhouse. Of course we needed a snack after our meal, and this satisfied us. These rock cliffs were beautiful. We decided to ride the Greyhound Bus because we have seen much of the world from 30,000 feet. Of course, at that altitude, we saw nothing. Also, we were the only foreign tourists on the bus, so we were able to talk to many Australian natives, many of them aboriginals. Everyone was very nice to us. Even when mom got stuck in a restroom stall. One of the beautiful young girls that sat across from us on the bus, helped her get out. Mom was very grateful for the help. Getting stuck in the bathroom was not fun and not part of our travel plans. So thank you again to that very nice girl. 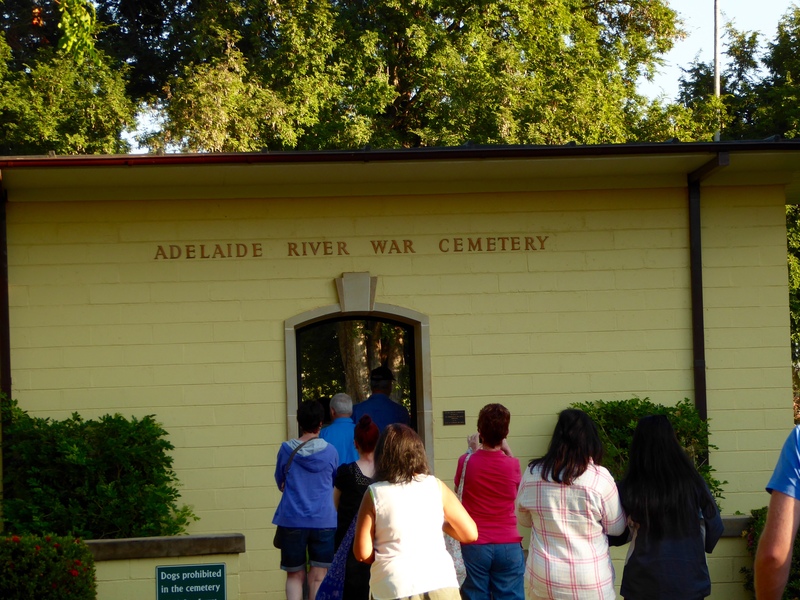 On another bus to Nitmiluk National Park, we stopped in the town of Adelaide River to visit the War Cemetery. This monument with a white cross was very nice. 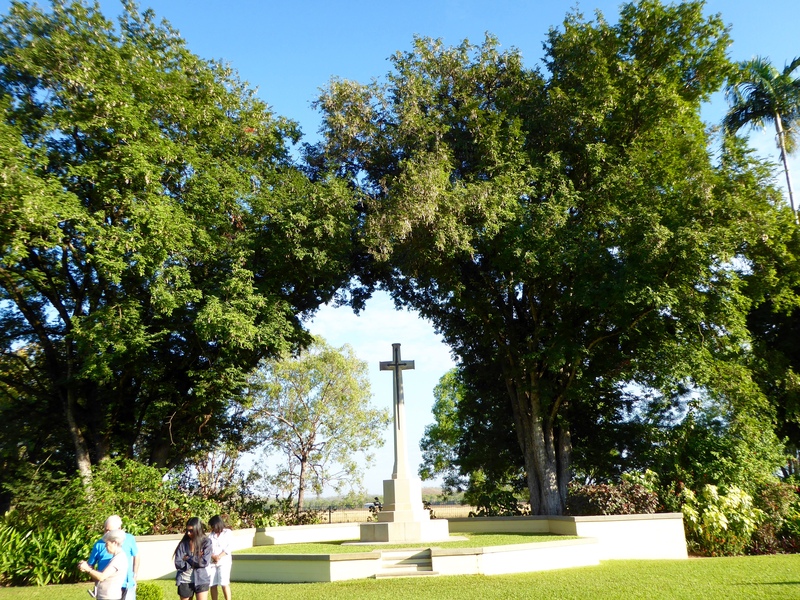 Many of those buried here were killed February 19, 1942 during air raids on Darwin. We loved this tree. 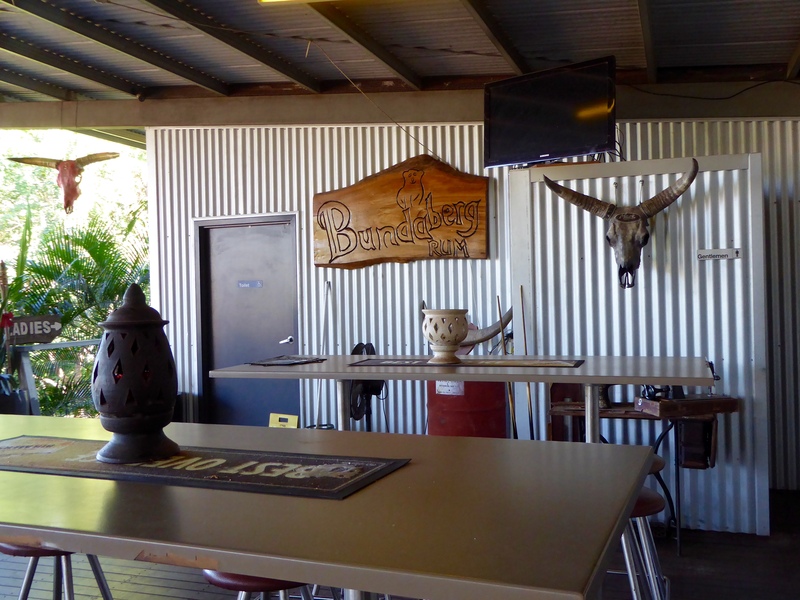 Further down the road, we stopped for a break near Emerald Springs Roadhouse. 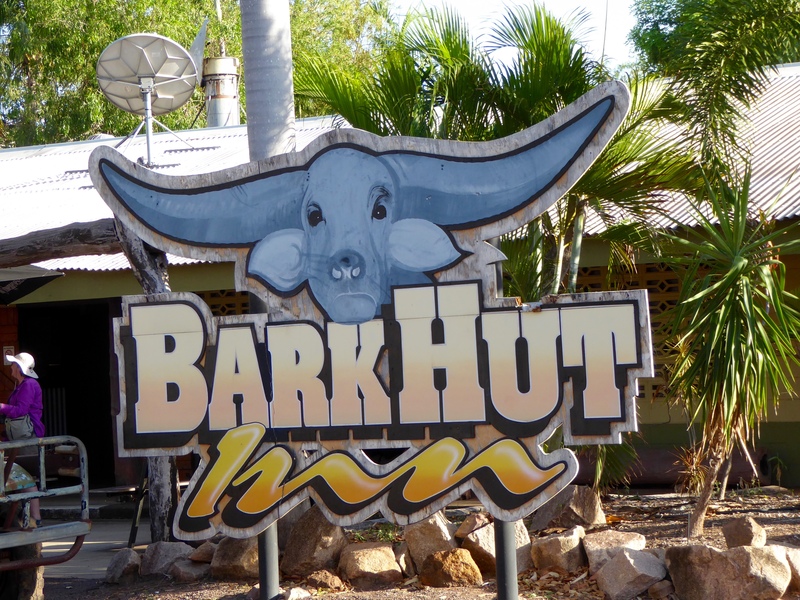 Another bus to Kakadu National Park stopped for our break at Bark Hut. This is where we saw an early model Toyota Landcruiser station wagon. This vehicle has been modified as a “Yard Truck” or “Push up Truck” to push, or herd, buffalo into yards and pens. The door panels were re-enforced after a man, sitting in the truck, was gored through his thigh. The buffalo horn came right through the door. 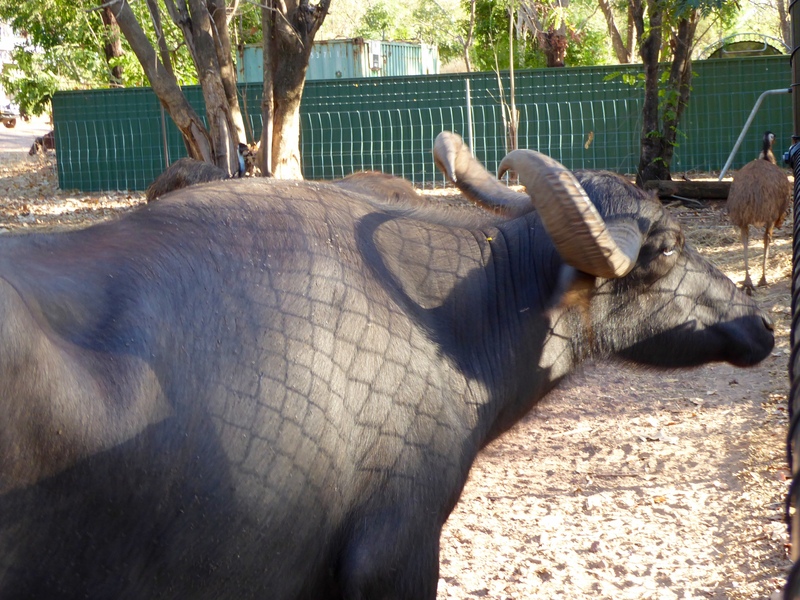 There are still wild buffalo in the Northern Territory. When we drove past a buffalo herd, the humans did not have their cameras ready. We hope you experience foreign travel in a public bus. You will see so much more and we learned so much from the local people sharing the bus.